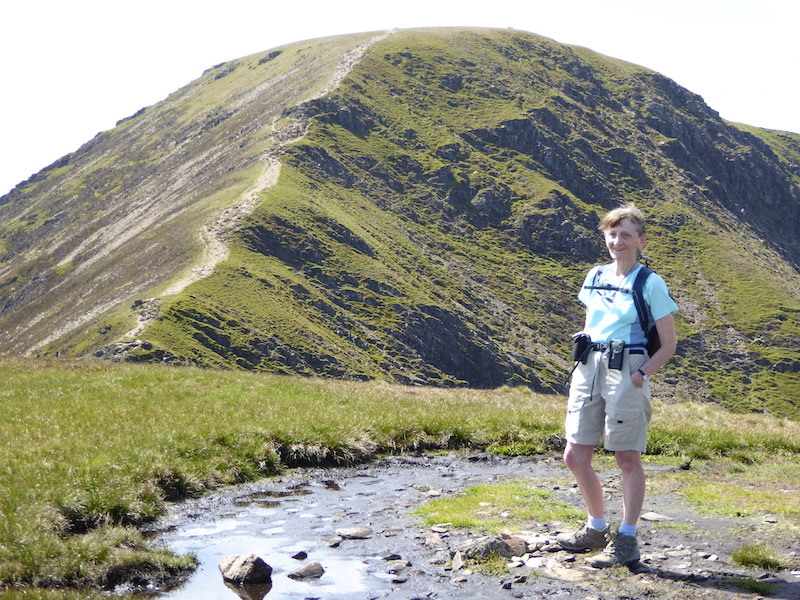 With the promise of warm, sunny weather we donned shorts and t-shirts and set out for a walk around the Coledale fells. 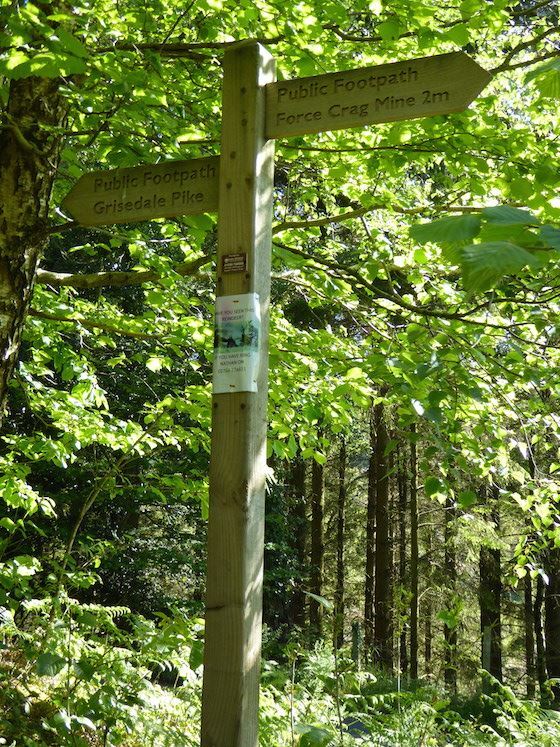 The car park up the road was already full so we had to park roadside a bit lower down and then trek back up to the start point, here by the sign post. 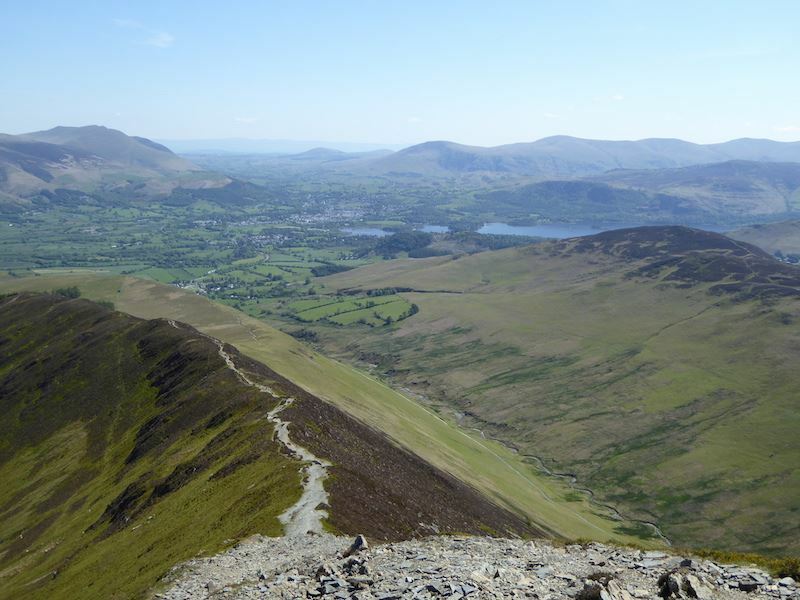 We’re going to Grisedale Pike, so its a left then. 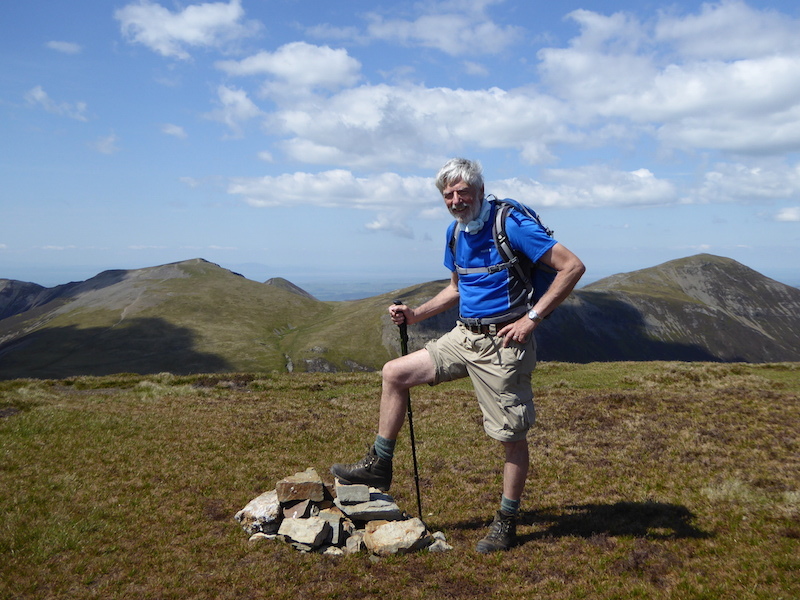 There’s no chance of a nice easy walk in to get the legs up and running as its uphill from the word go. 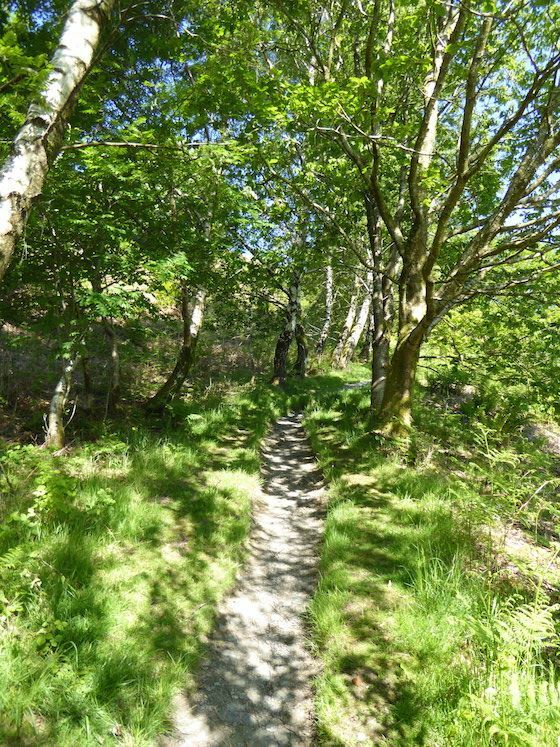 Here the rising path takes us through the woodland before we reach the open fellside. 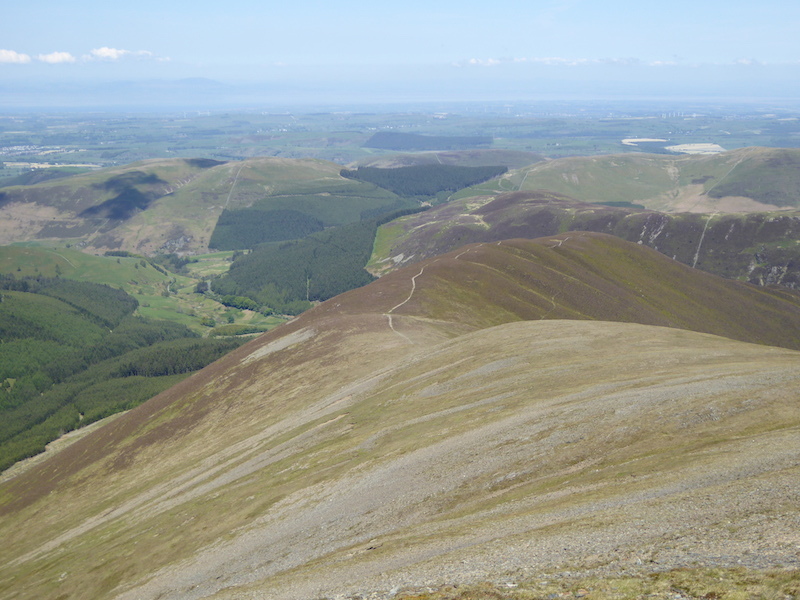 Once you’re out of the woods behind you is this extensive view of the Skiddaw fells. Bass Lake, and the lone fell in the centre is Binsey. 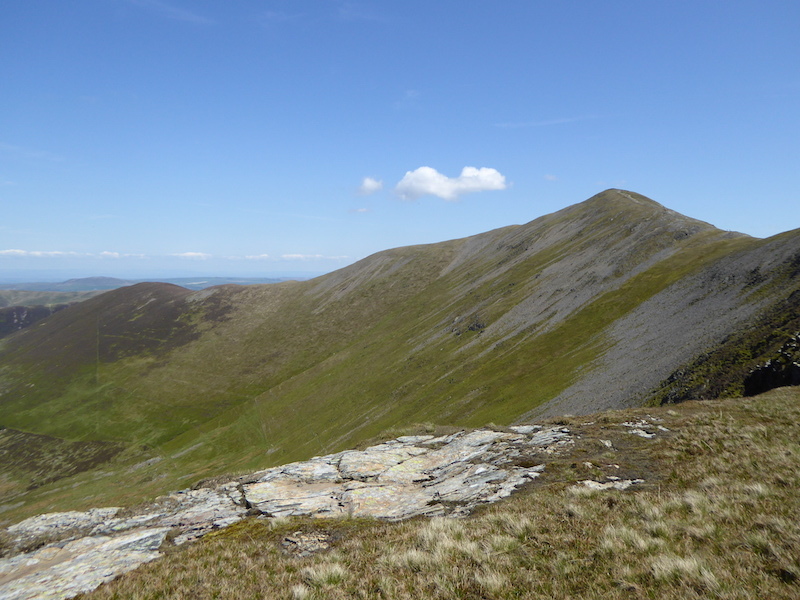 Looking eastwards and over on the right are Clough Head and Great Dodd. 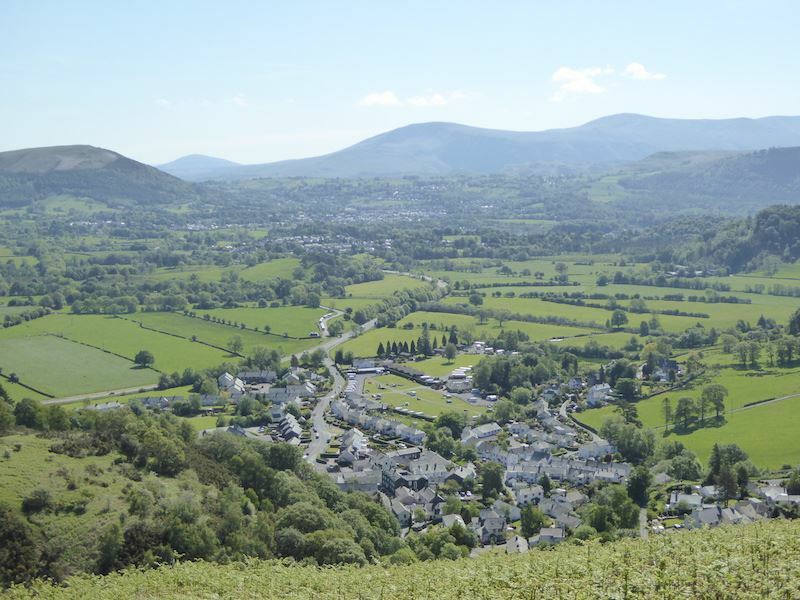 Looking down at the village of Braithwaite with Keswick beyond. 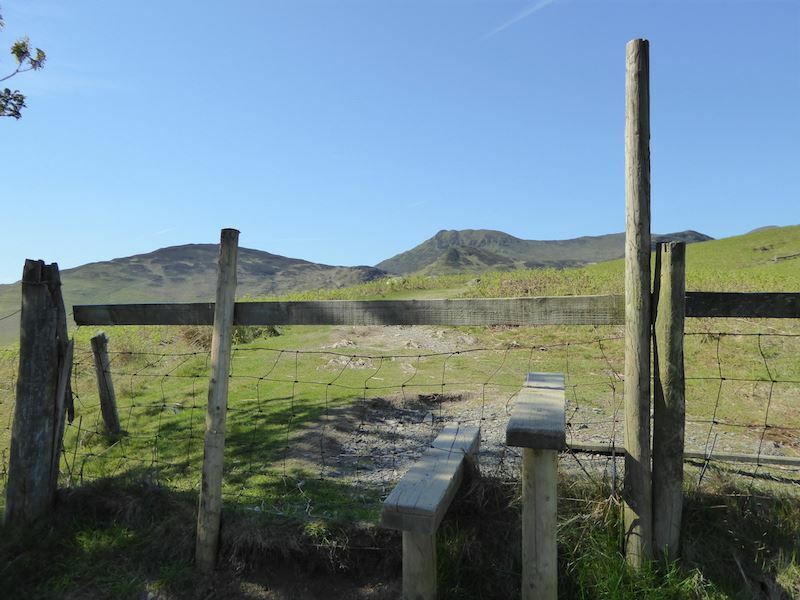 Over the stile the highest peak on view is Causey Pike, we’ll be over there later on, much later on as there is a lot to climb before we get there. 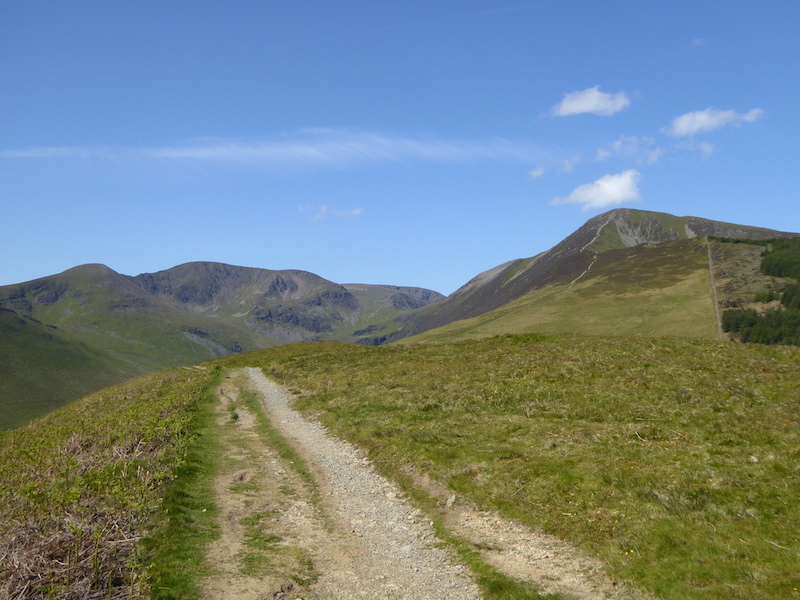 More of the Coledale fells appear as we walk along Kinn, over on the left is Causey Pike again, and on the right the rounded hump of Sail which leads over to Crag Hill on the far right. 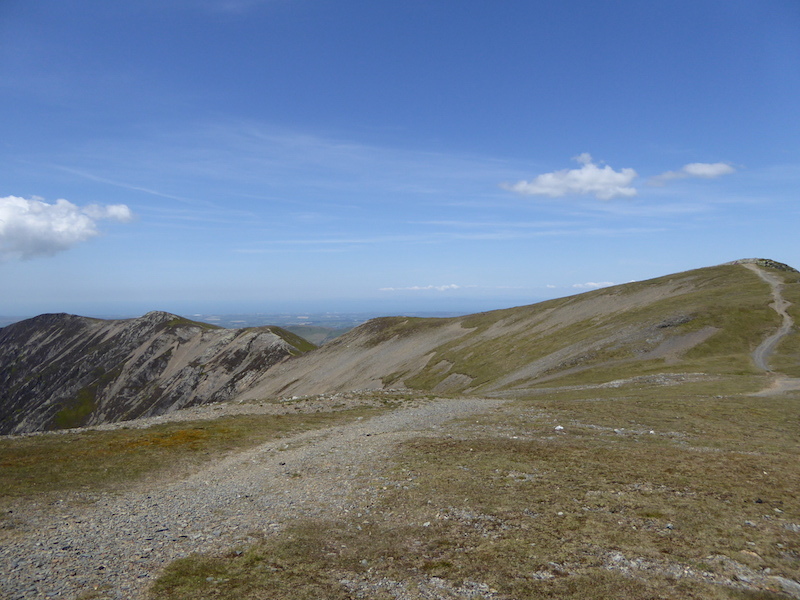 Grisedale Pike, our first objective, is over there on the right. A nice level stretch on Kinn before we get there though. 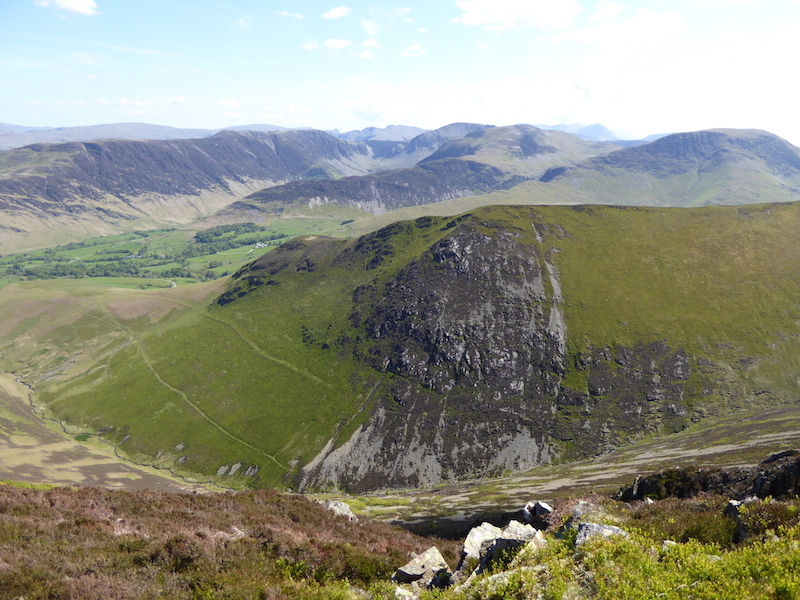 Looking across the Coledale valley to Barrow on the left with Causey Pike up there on the right. 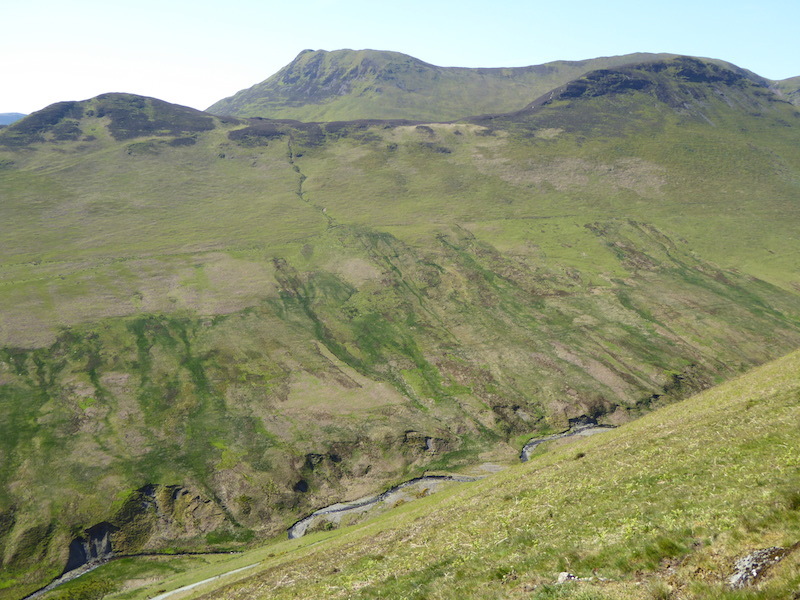 A look down at Coledale beck in the valley below. 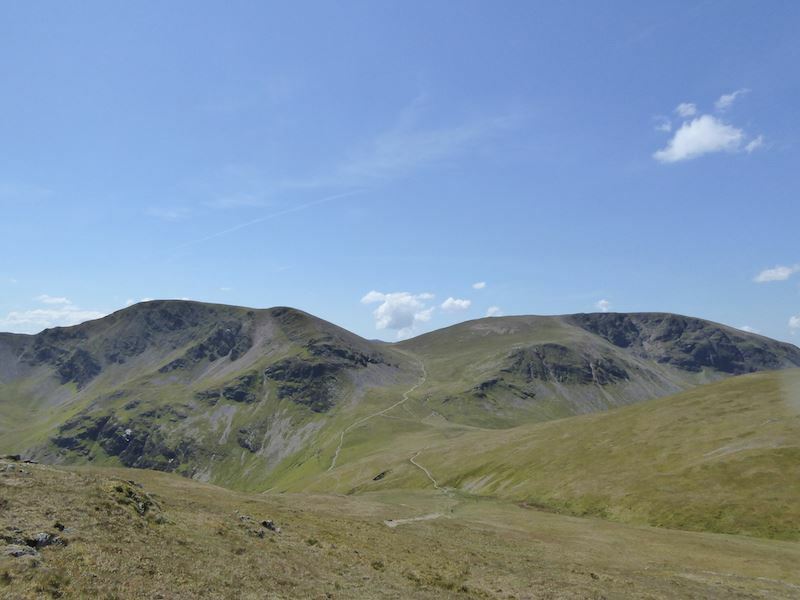 Looking up at the head of Coledale, the view is of Crag Hill in the centre, to the left is Sail and to the right is Grasmoor. Oh dear, its getting closer to the time when the level path disappears and the climb begins. There’ll be a few ‘pit stops’ on the way up there I can tell you. 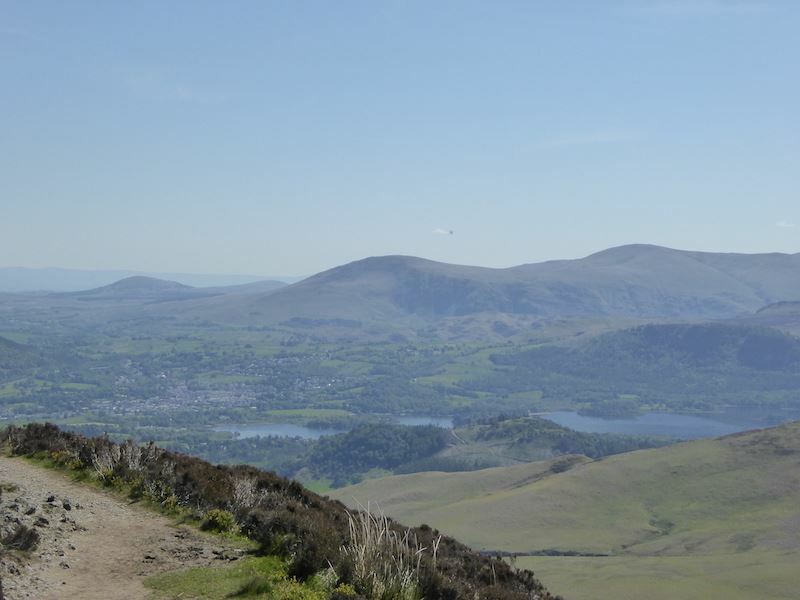 A look back over at Keswick with a little glimpse of Derwentwater as we start to climb. 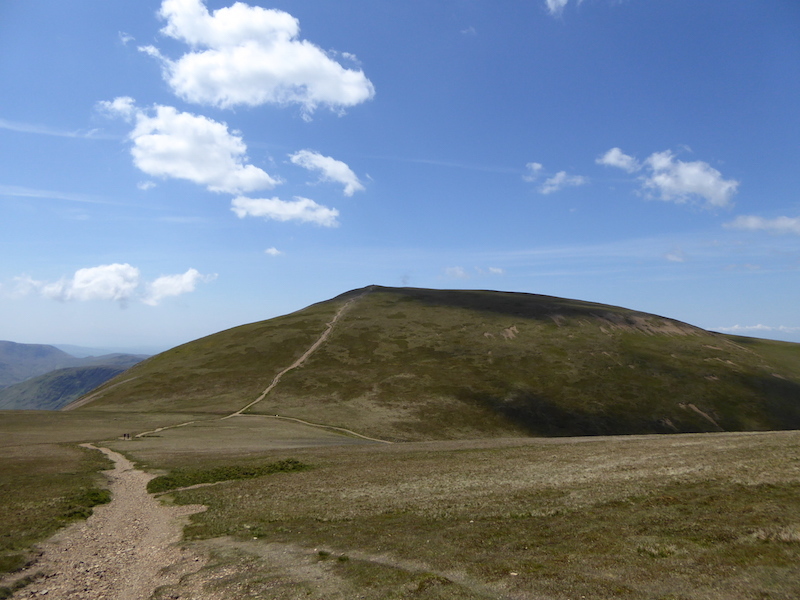 A closer look at Sail and Crag Hill, they’re on the walk route too so there’s fair bit of climbing to be done today. 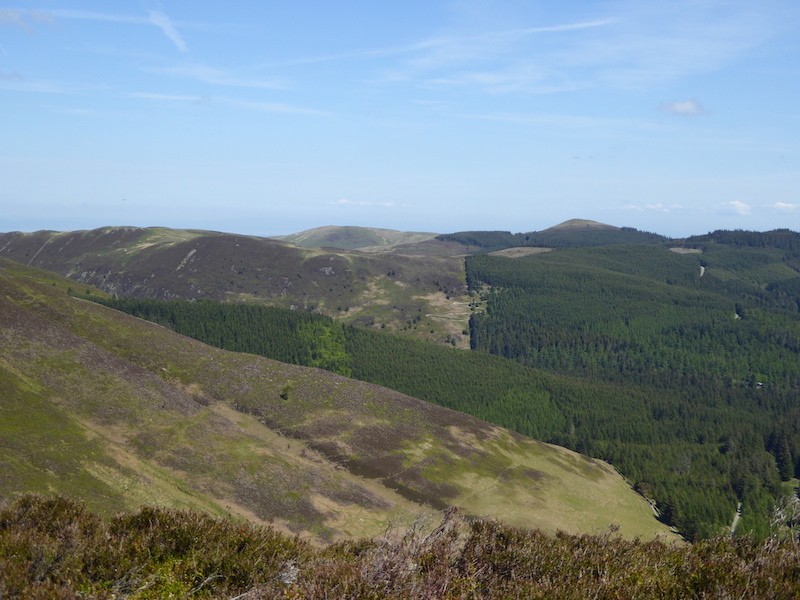 Looking across to the other side to the views of the Lord’s Seat fells, Lord’s Seat being the one over on the right, just peeping out above the tree line.The fell with no trees to the left of it is Broom Fell. 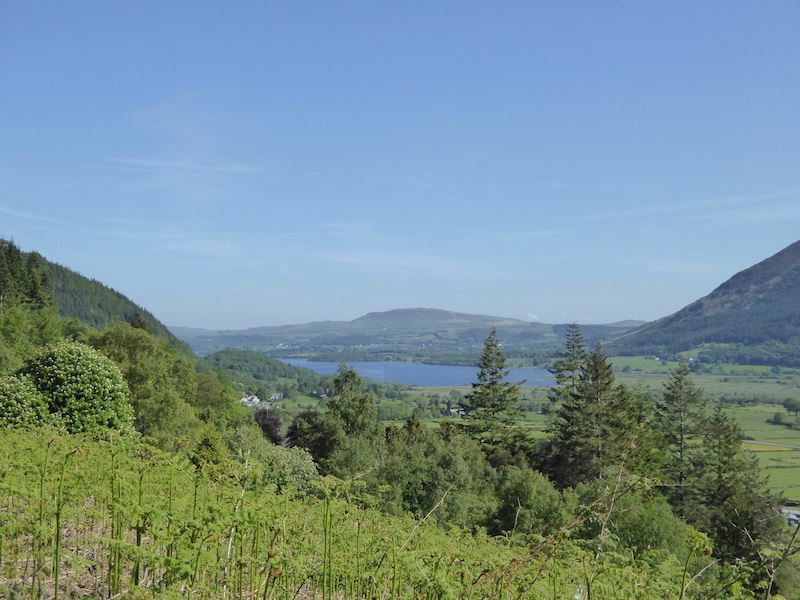 The views are really opening up now and we can see more of Derwentwater with Clough Head and Great Dodd to the right of it. 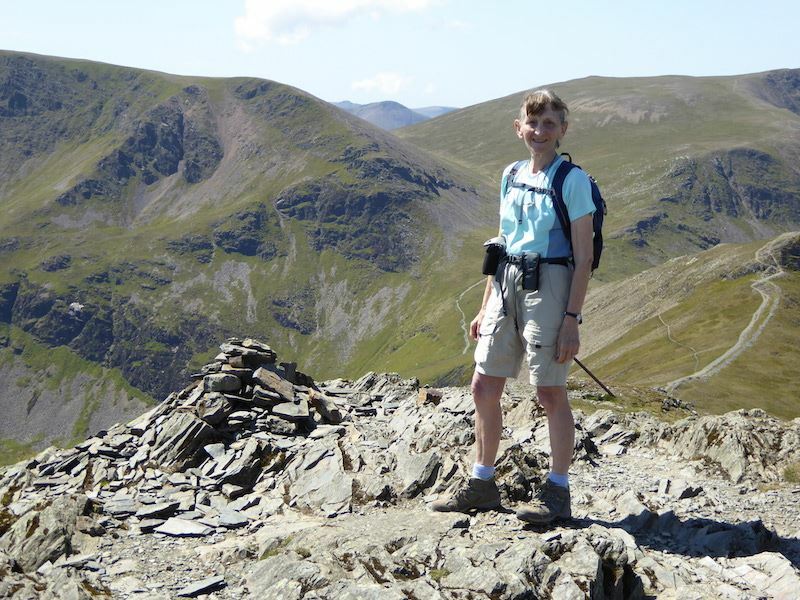 Kinn has been left behind and now we are on Sleet How looking again at the Skiddaw fells and the conifer covered Hospital Plantation. Having just climbed this very steep bit we have a bit of a breather, a mop of the brow and a turn round to take in the view. 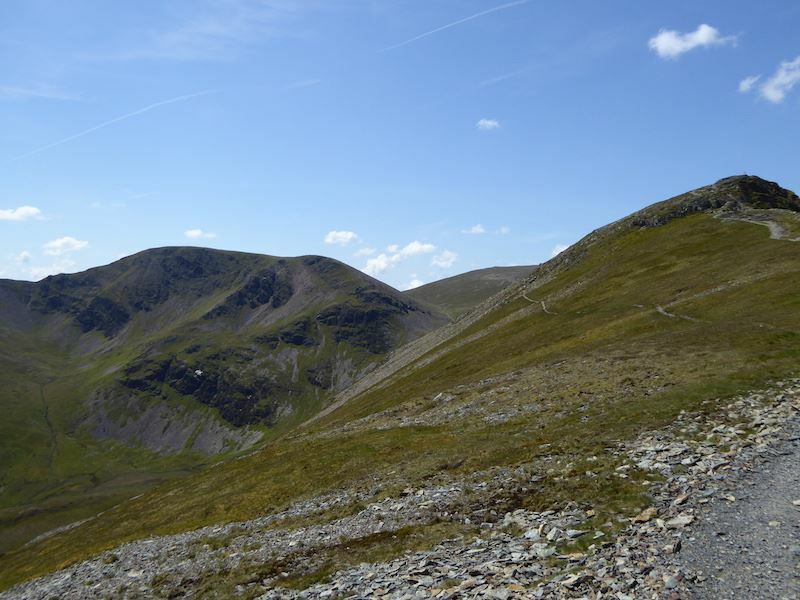 The calf muscles are definitely complaining now and its not just down to the steepness, I’ve been having pain in them for a while now, even walking up a slight incline when shopping in Penrith, so I think there’s a bit of a problem which needs looking at. I’m hoping a visit to the sports injury massage therapist will sort things out. Phew, that was warm work but we made it. 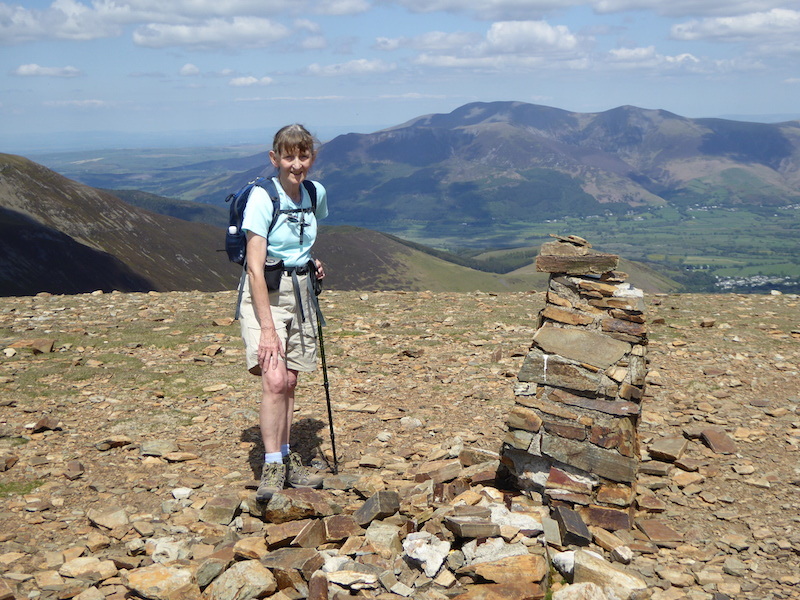 Here we are on the summit of Grisedale Pike and over on the right is the next port of call, Hopegill Head. 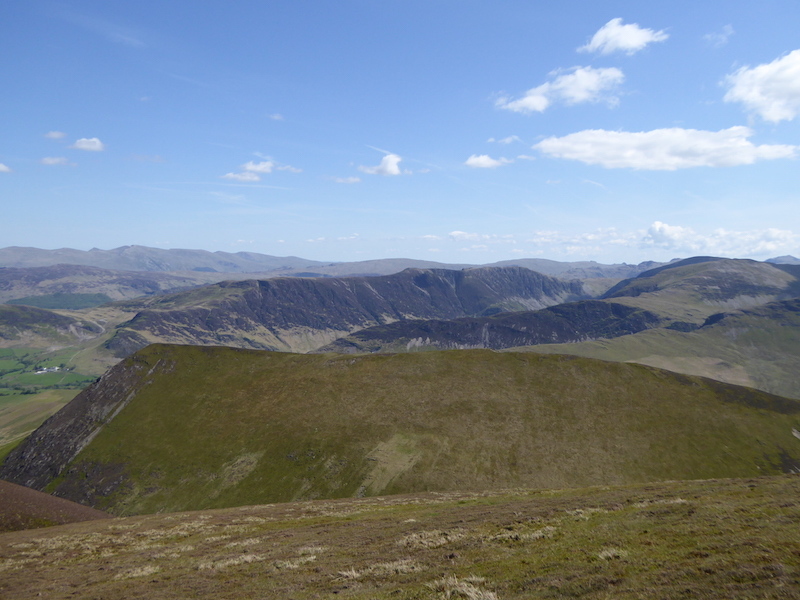 Grasmoor is over on the left. 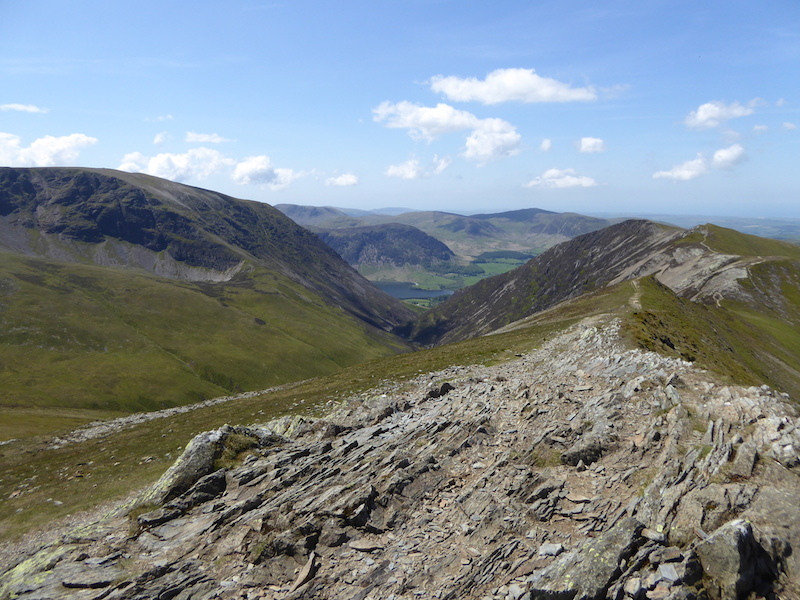 Looking across at Hopegill Head which drops down to Ladyside Pike over on the right. 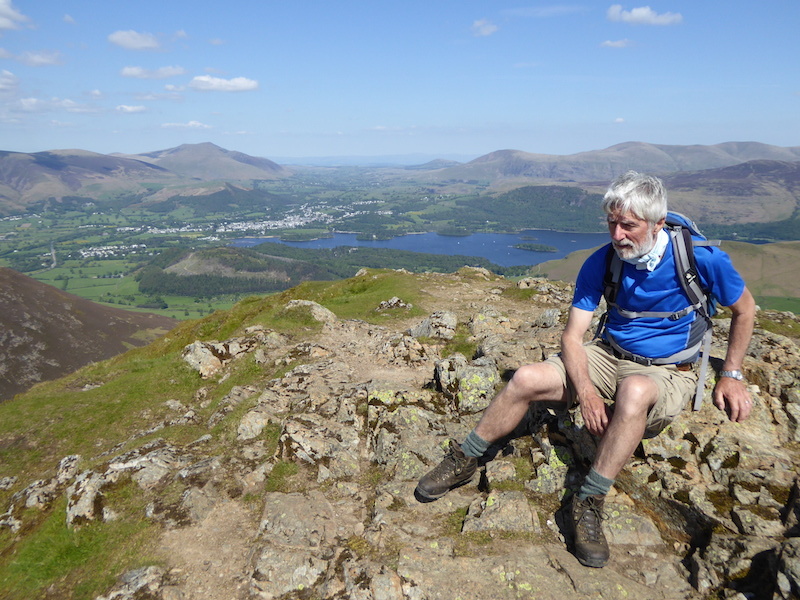 A brief moment of rest for the leg muscles on the summit of Grisedale Pike. 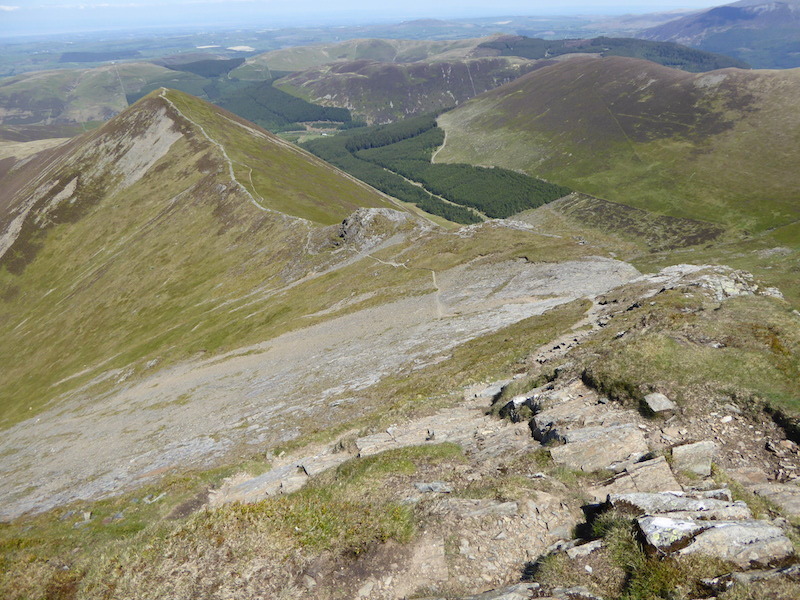 This is another path up to Grisedale Pike, this one comes up from Hobcarton End down there. 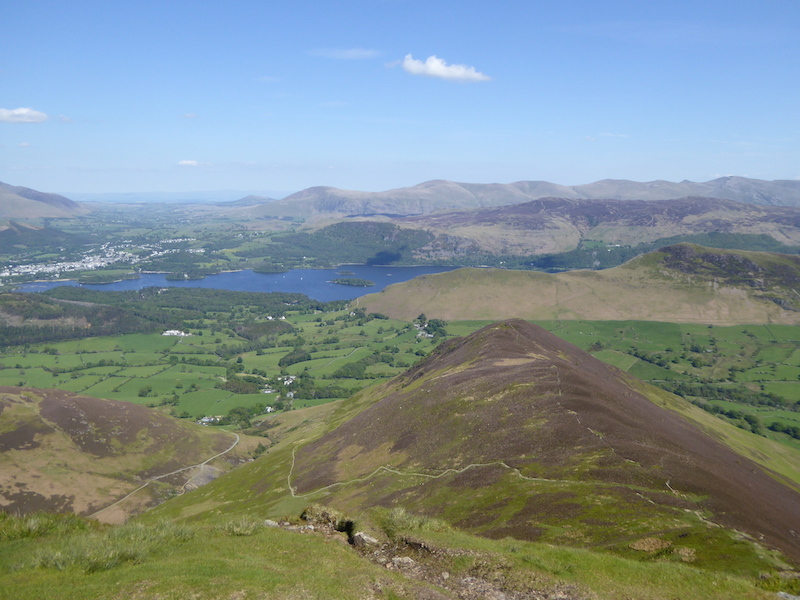 A good view of Derwentwater with Clough Head on the left and the Dodds stretching along to the right. 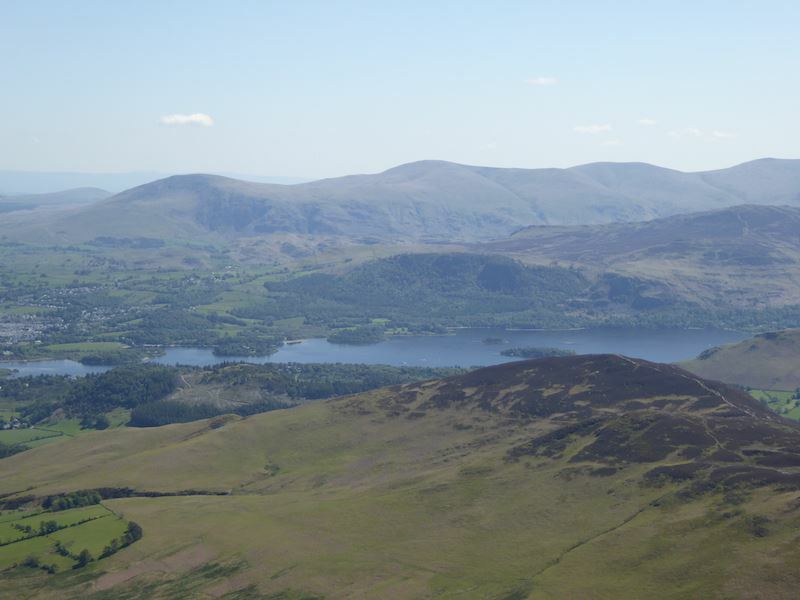 The little fell below them alongside the water is Walla Crag. 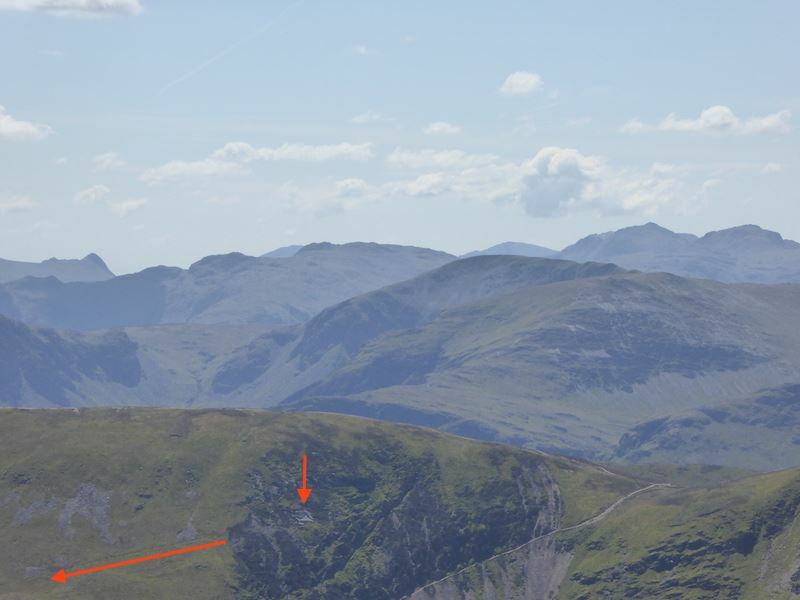 Fells on view everywhere from Grisedale Pike summit, but what caught my eye was the building on Scar Crags indicated by the short red arrow. 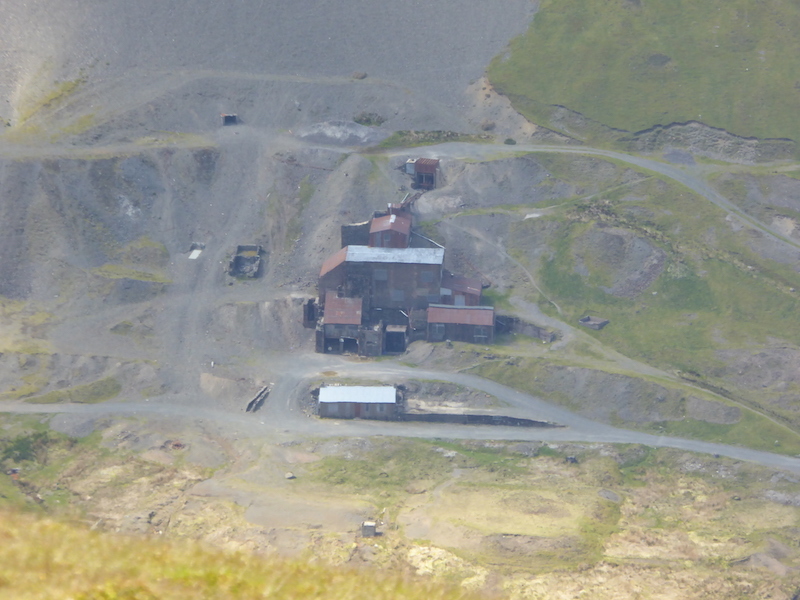 A bit of research seems to indicate that this is what remains of the Lake District’s only cobalt mine. 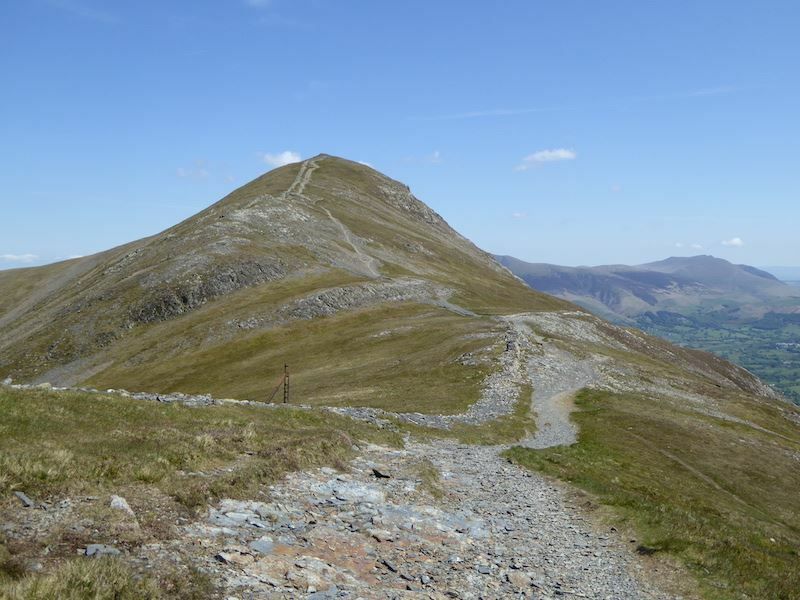 It was opened by the Keswick Mining Company in 1846, who invested £7,000 in the project. 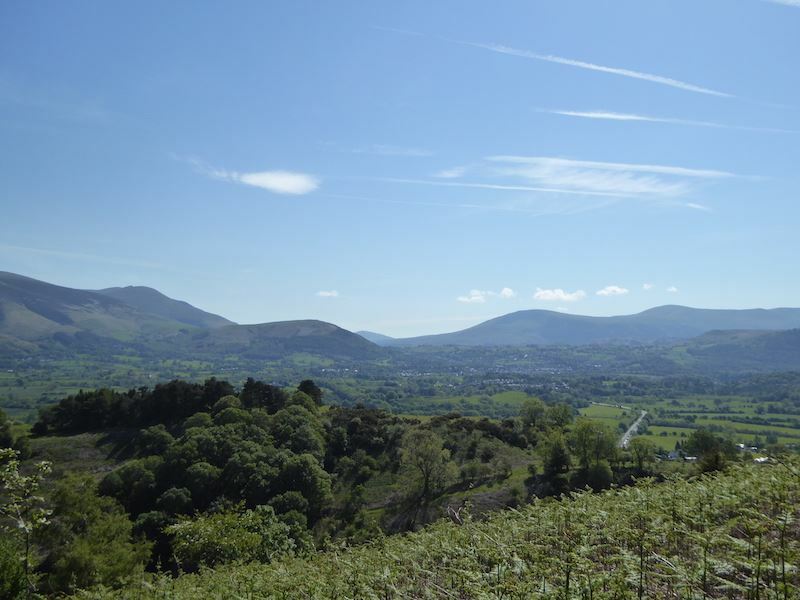 A road and an inclined tramway were built to convey the ore down to Stoneycroft in the Newlands valley. Four adits were driven into the hillside, the longest being about 60 metres in length. The mine was not a success as it was impossible to extract the mineral from the ore in the expected quantities and it closed in due course. 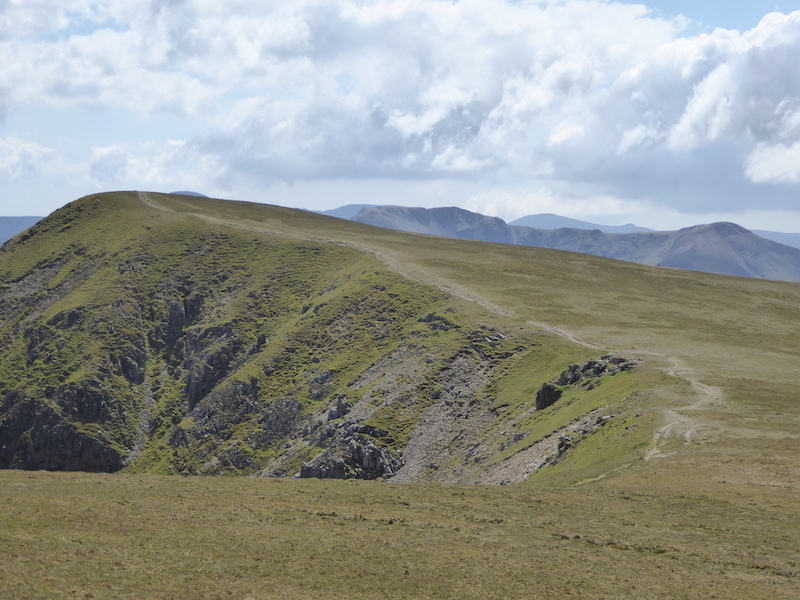 Just above the longer arrow you can see what looks to be the course of the old tramway. 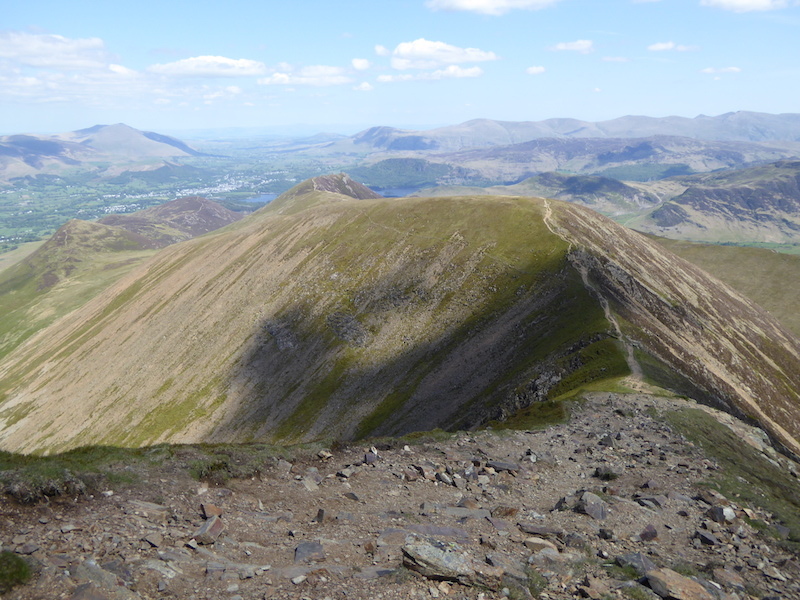 Crag Hill and Grasmoor in view from the rocky top of Grisedale Pike. 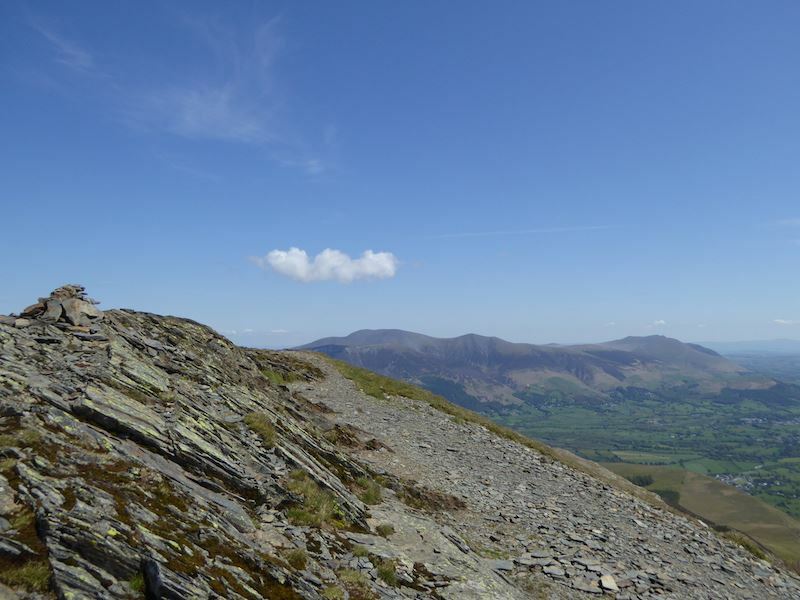 Looking the other way the view is of Skiddaw, just below the little cloud, and over on the right is Blencathra. 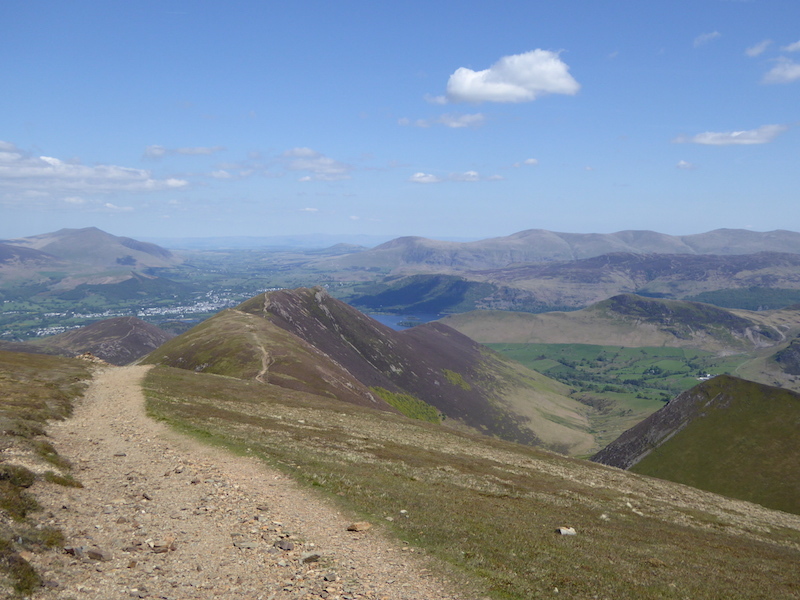 Dropping down off Grisedale Pike now and following the path over Hobcarton Crags to Hopegill Head. 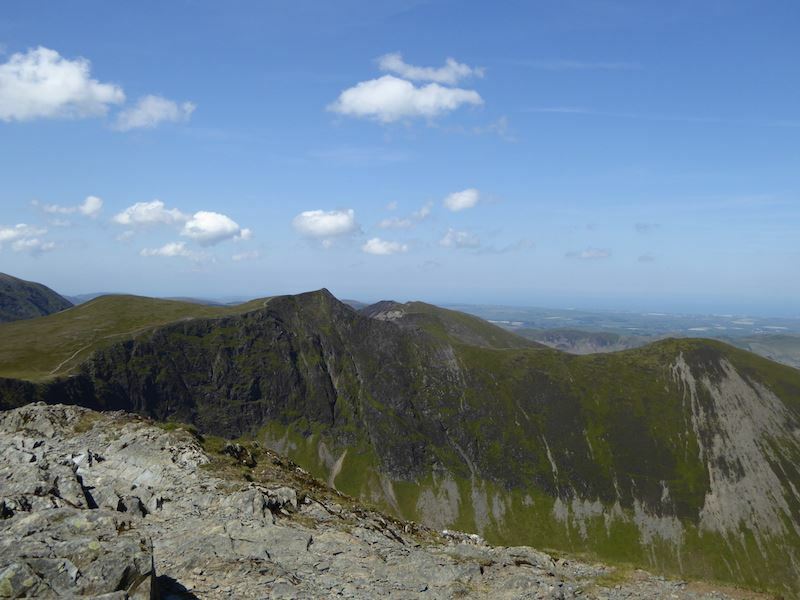 Grasmoor immediately in front of us on the skyline. 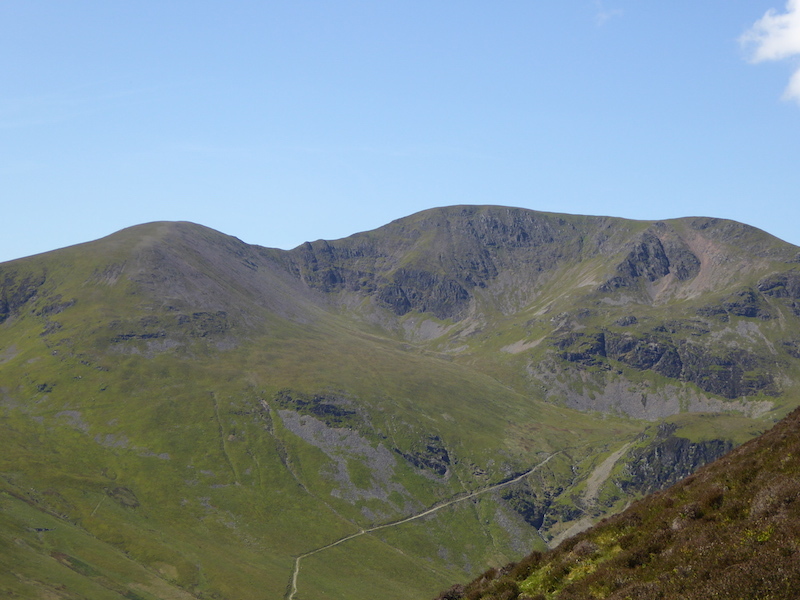 Approaching the rocky section over Hobcarton Crags with Hopegill Head over on the right. Crag Hill over on the left of the Hobcarton Crag section. 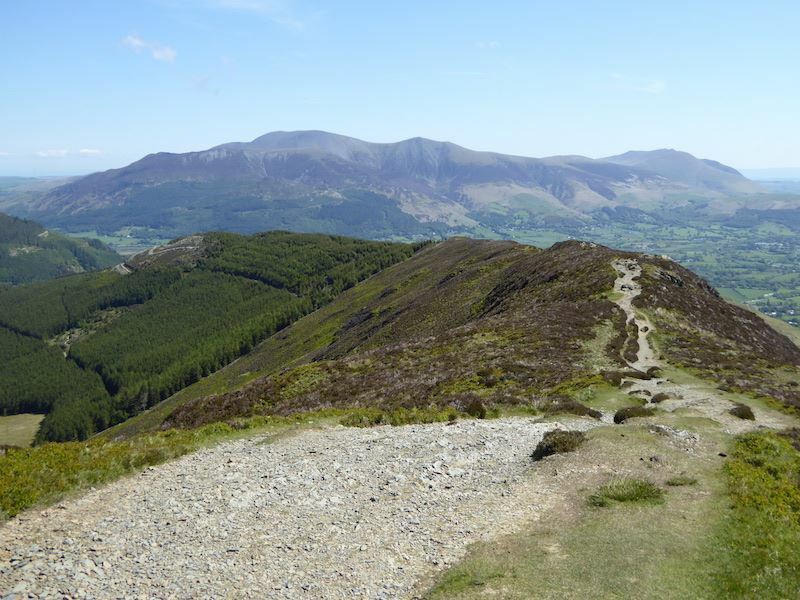 A look back at Grisedale Pike. 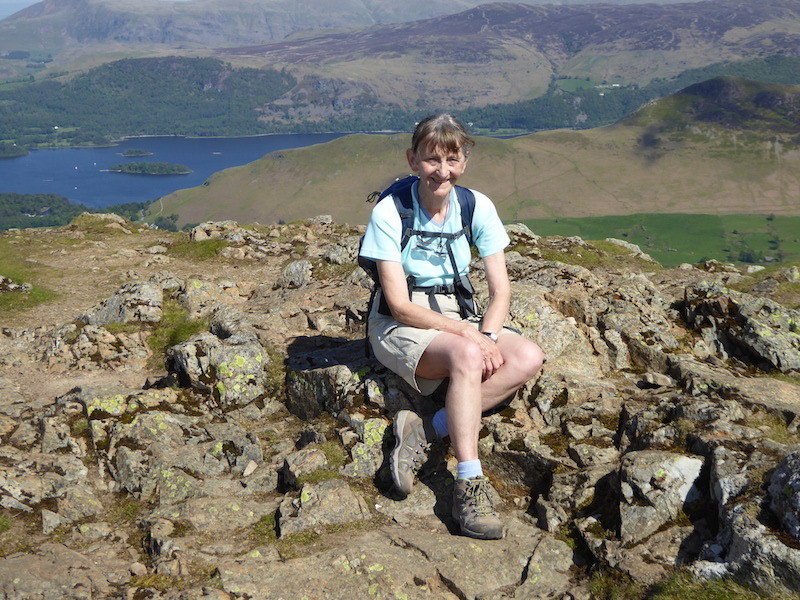 Another bit of climbing required to get over the rocky crag. People who haven’t lost their sanity will now be sitting on a beach or in a park, eating ice-creams and enjoying the sunshine. 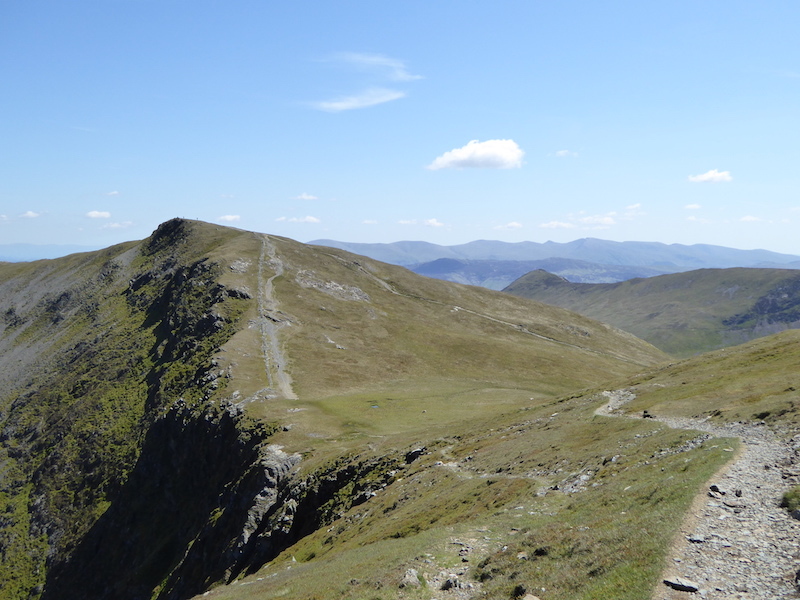 We will eventually take the path in the centre as we head for Crag Hill on the left. 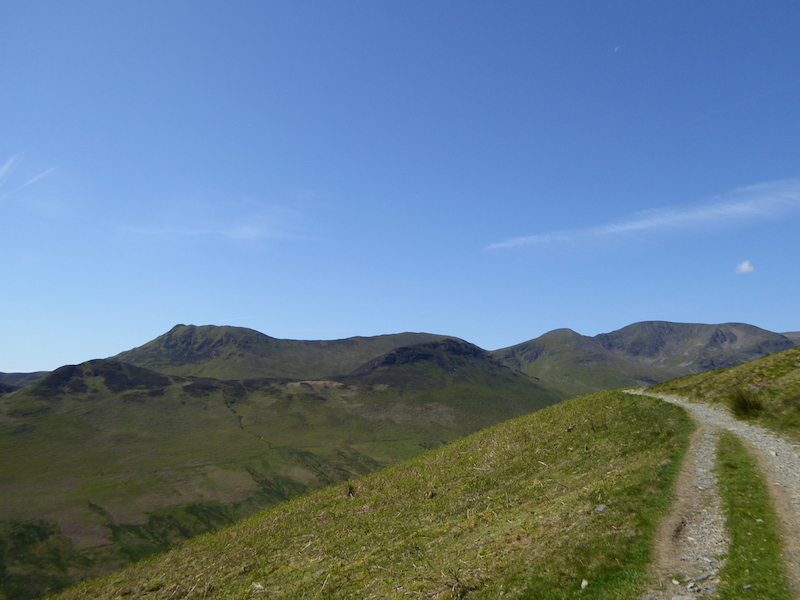 Grasmoor, on the right, is not part of our route today. Before any of that happens we still have the little matter of Hopegill Head to deal with. 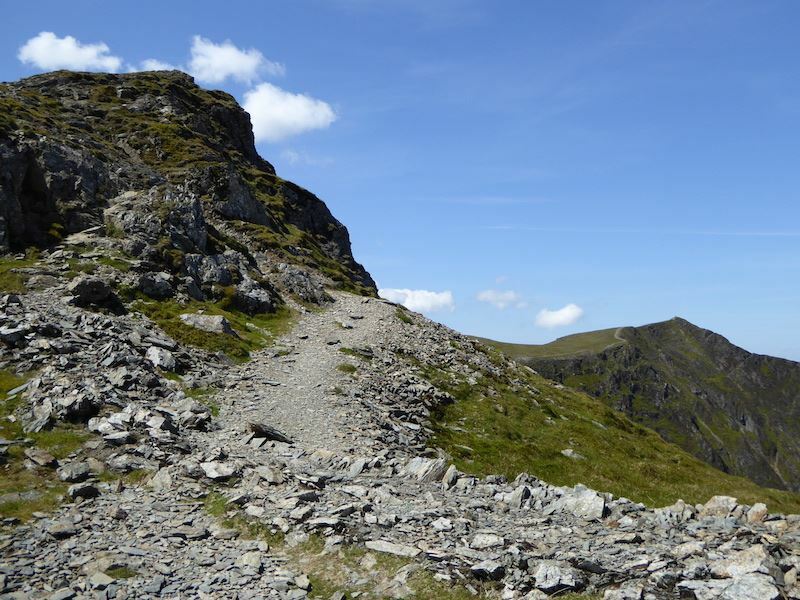 Here we approach the paths over Hobcarton Crags, which one shall we take? We chose the lower path. 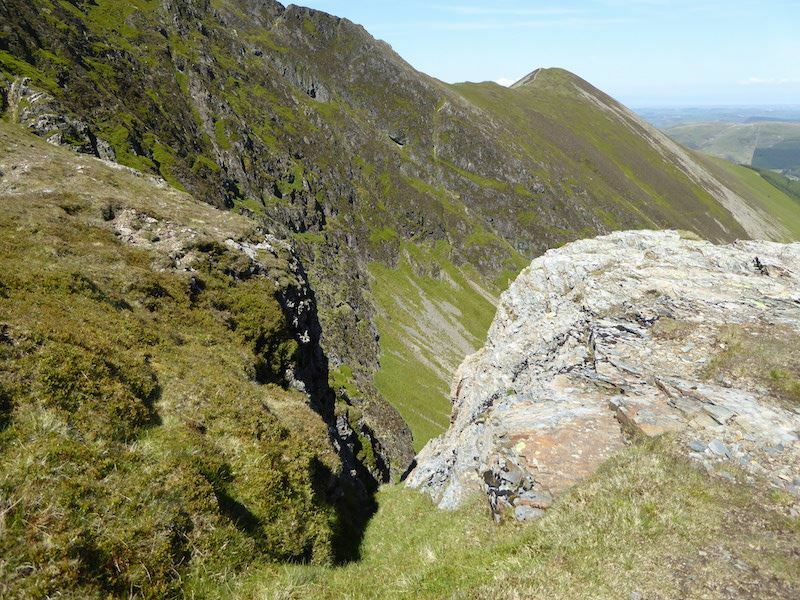 There’s a deep cleft in the crags alongside the path, this was as close to the edge as I was prepared to go. 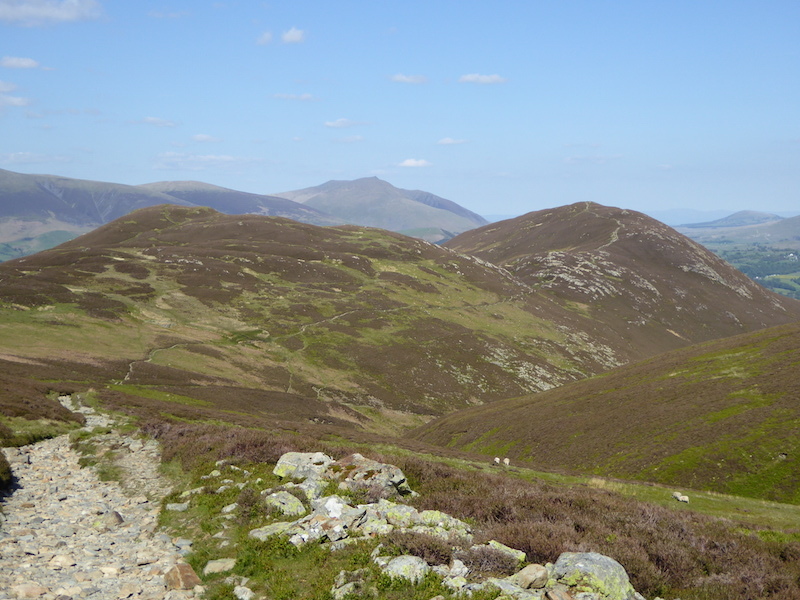 A look back at Grisedale Pike and the long ridge down to Hobcarton End. 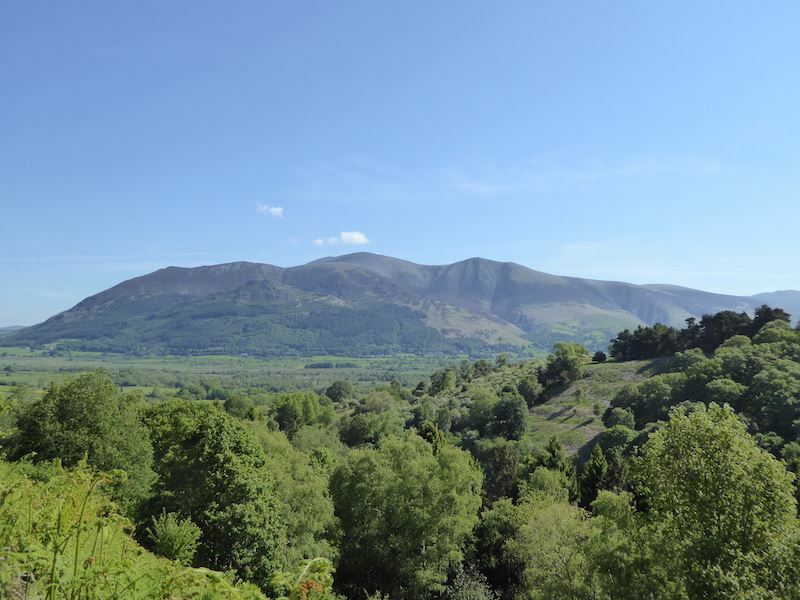 Grisedale Pike across Hobcarton Crags. One of us is not happy on this section, the path is far too near a long drop for comfort. The lower path has now joined the higher one which pleased the other member of the party no end. 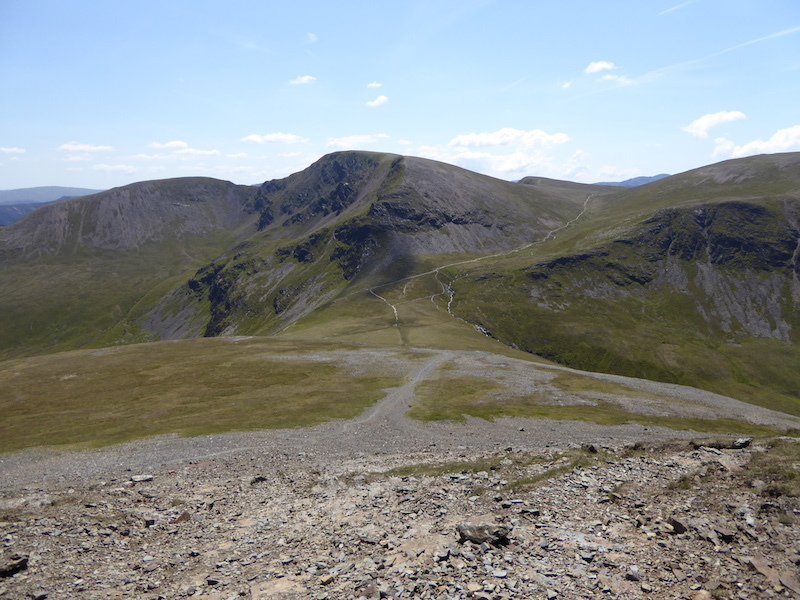 We’re now on Hopegill Head summit and looking down to Ladyside Pike towards the left of the photo. 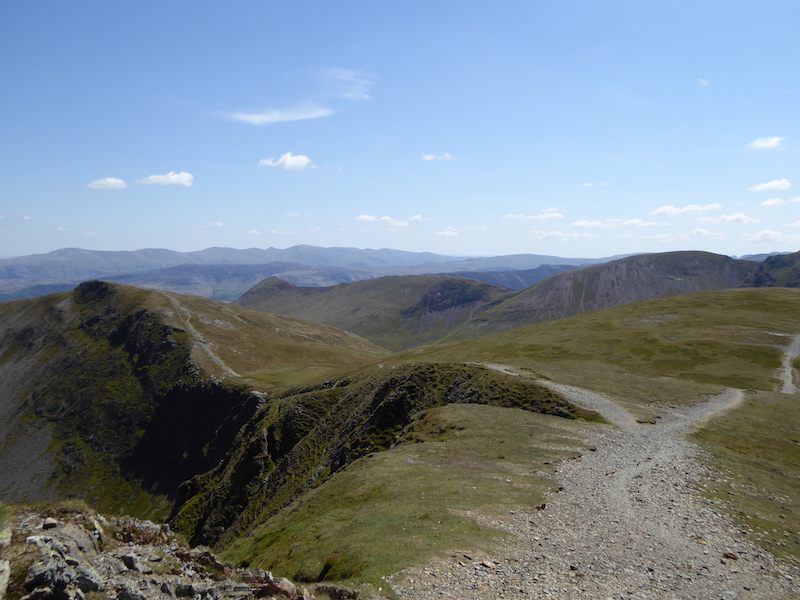 A path from Hopegill Head goes along the ridge to Whiteside which is an interesting experience. 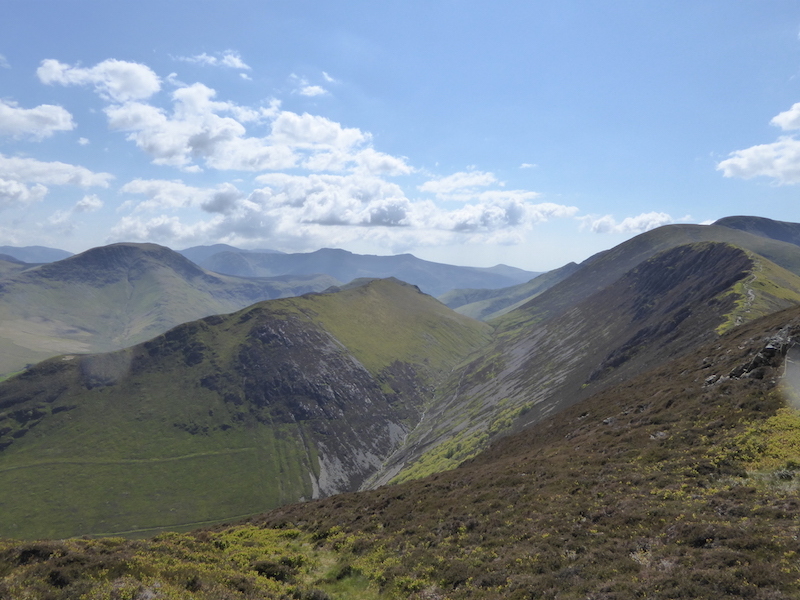 On the left is Grasmoor and running between the two is Gasgale Gill. 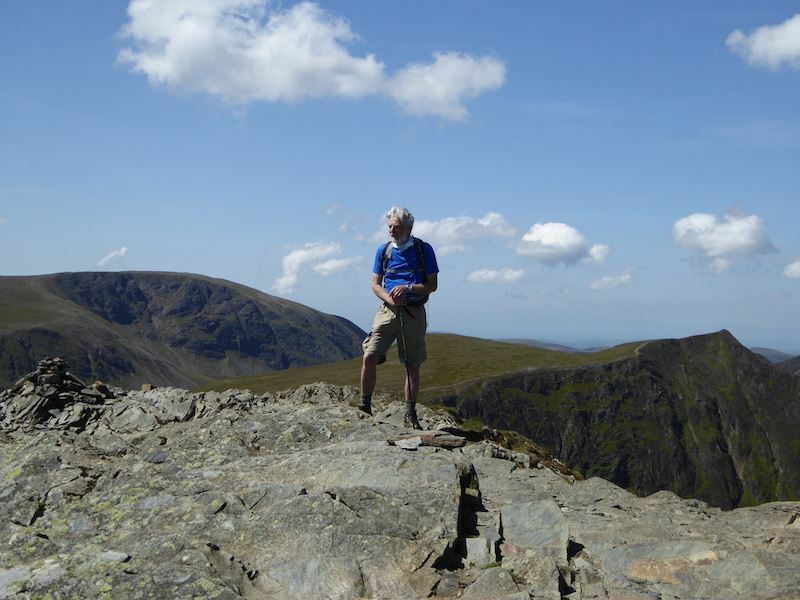 The water down there is Crummock Water. 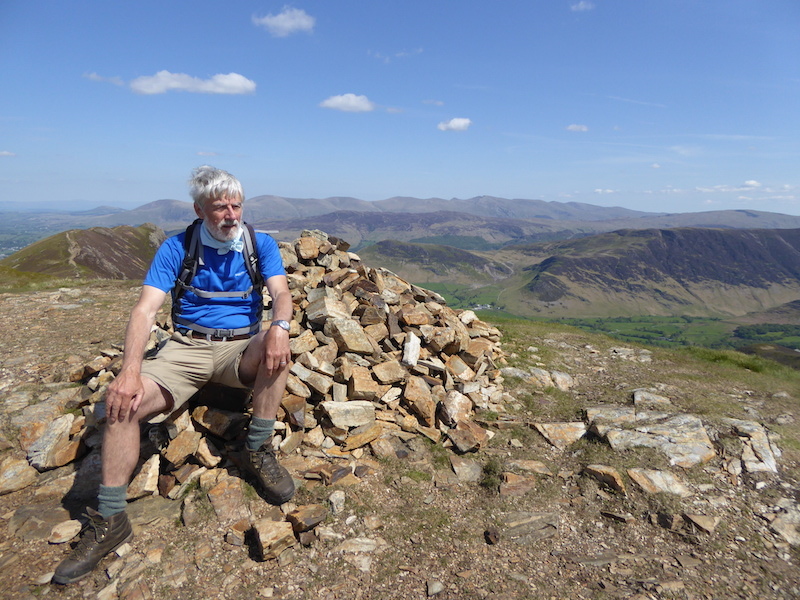 A welcome sit down on Hopegill Head with Whiteside at the end of the ridge. 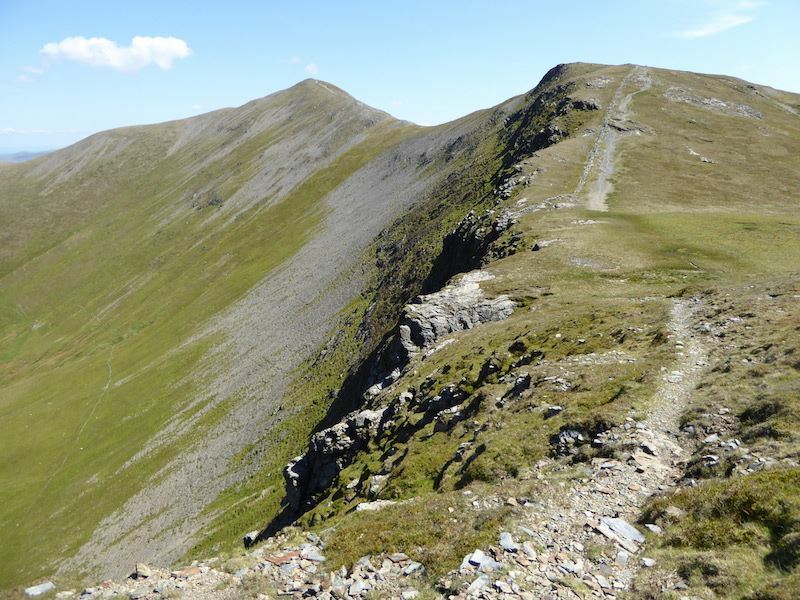 Here’s the path we need to take from Hopegill Head which will take us over Sand Hill and then down to Coledale Hause. About to leave Hopegill Head so staying seated wasn’t an option. J’s about as good with exposure to steep drops as I am, but, strangely enough, Hopegill Head doesn’t have such a strong effect on me as it does him. Leaving Hopegill Head and the path we took up to it is there on the left, we go straight on now to Sand Hill. 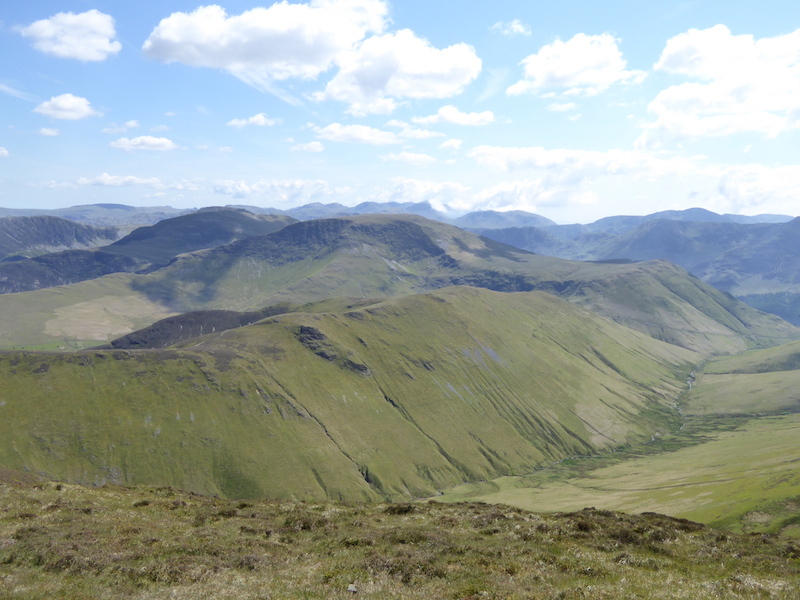 Looking back to Hopegill Head and the ridge across to Whiteside. 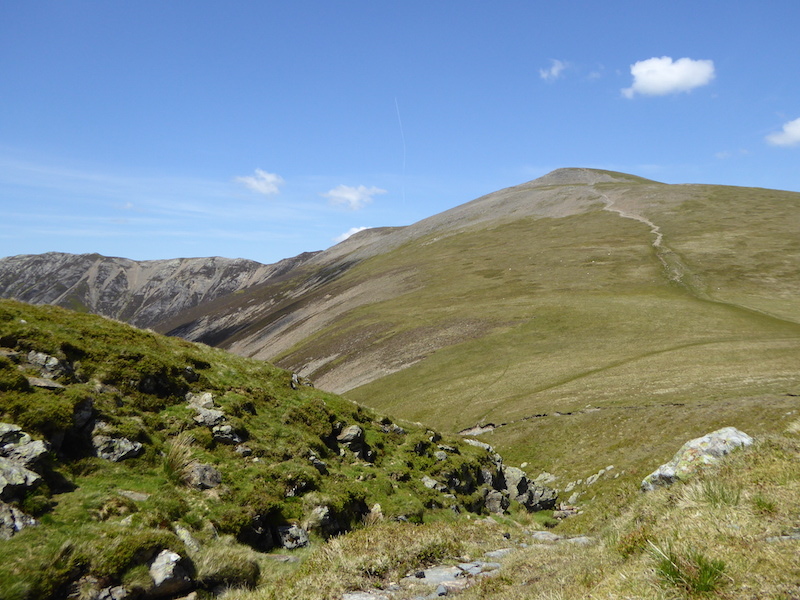 Dropping down to Coledale Hause from Sand Hill and aiming for a lunch spot alongside the gill over there. 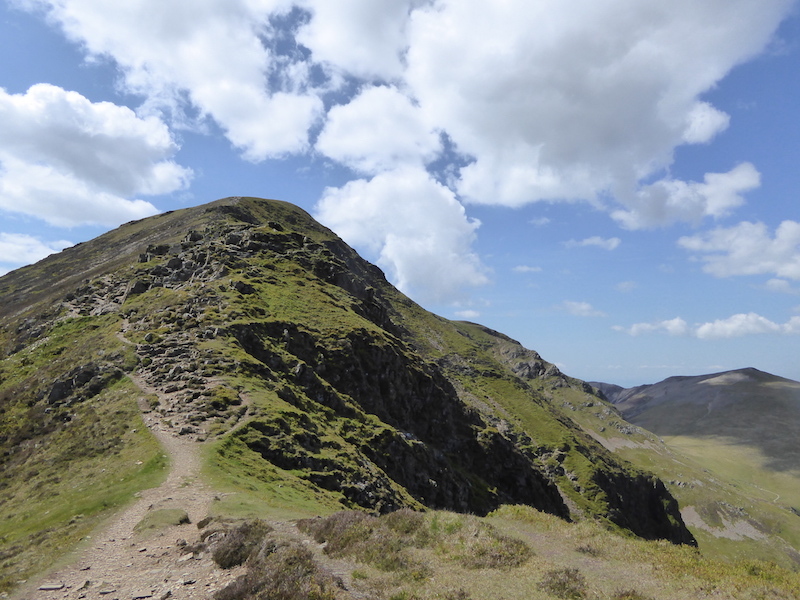 The path down is very loose and steep so its easy to end up on your backside if you aren’t careful. The view across to Sand Hill from our lunch spot. 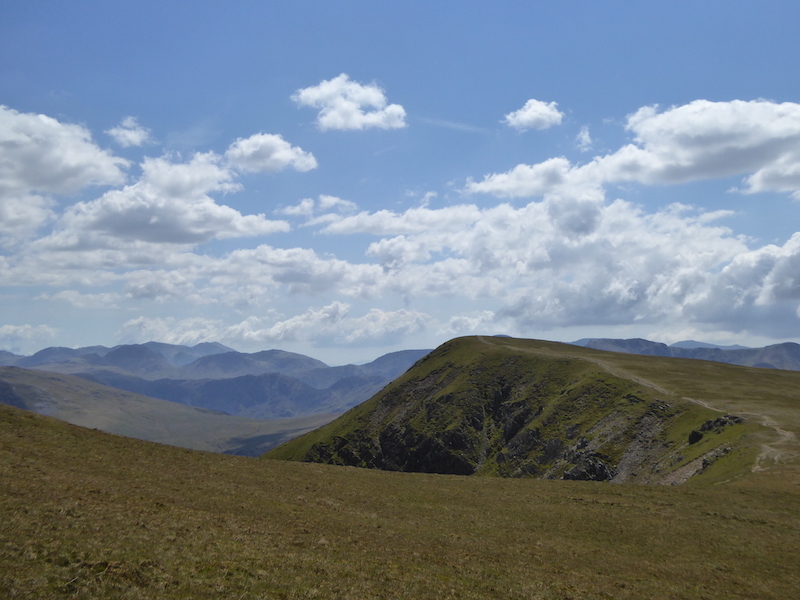 Peeping round the corner from the lunch spot and a view of the fells we have just walked across. 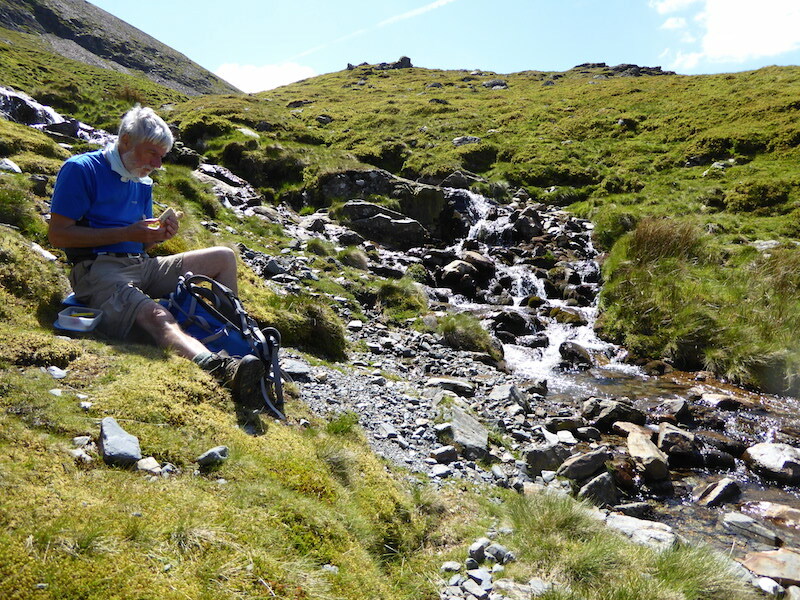 Lunch over and we resume our walk, now heading up between Grasmoor and Crag Hill. From the path this is looking back at the fells we have already walked over. The path we were on in the previous picture is the one coming up from the right and it meets up with all the others up here. 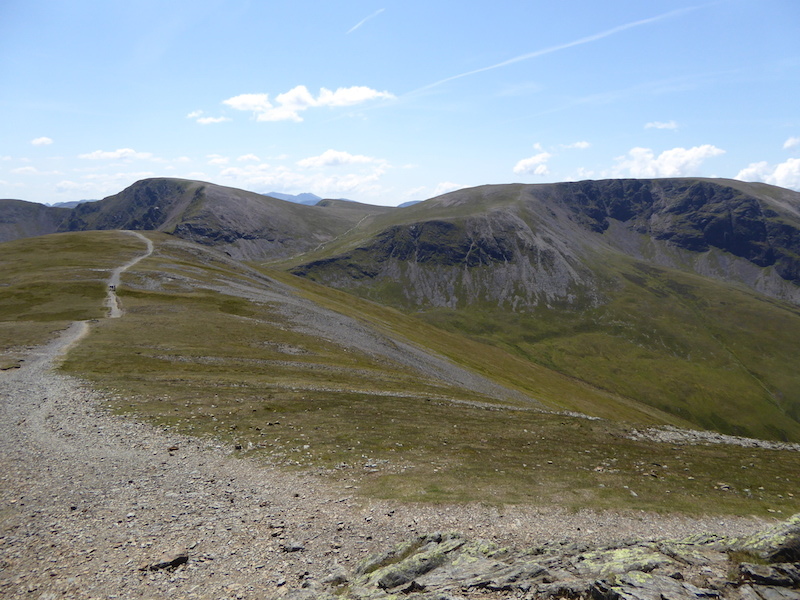 At the crossroads we came up to the left, the path to the right goes on up to Grasmoor. A close up of Wandope. 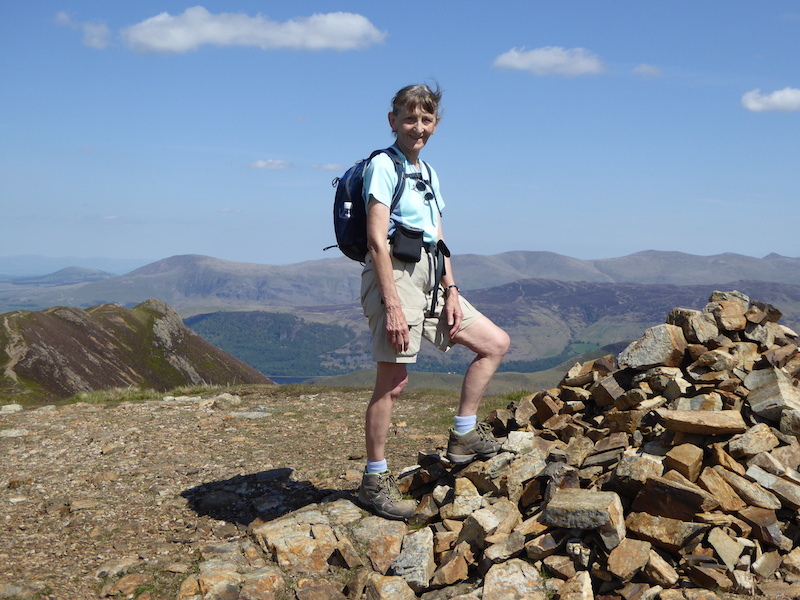 On the summit of Crag Hill and the cairn finally collapsed last year I think. There were bags of mortar under the stones so its going to be put back on its base at some point. 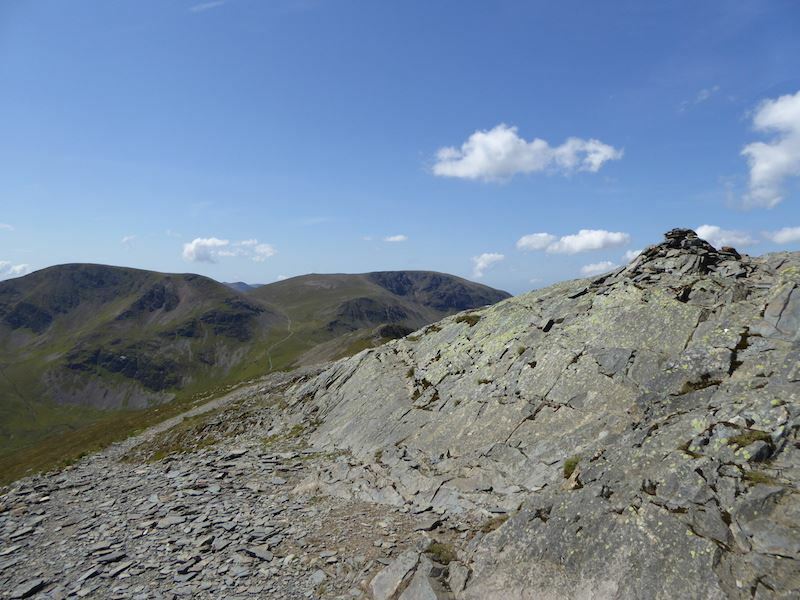 The poor thing looks to be in a sorry state and before you start agreeing, its the trig point I’m talking about. 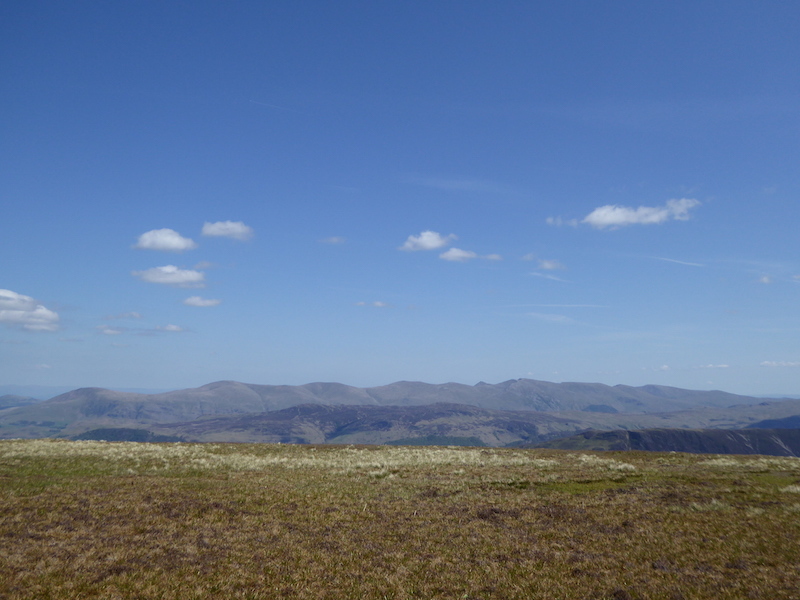 Layers of fells on view looking south easterly from Crag Hill. 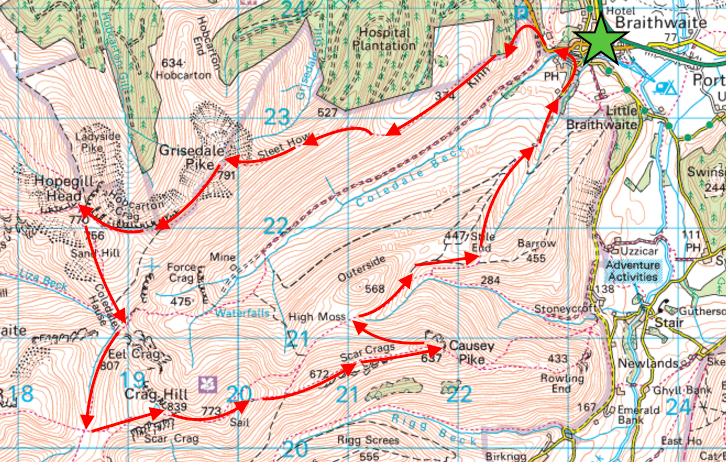 Here we go then, down the path from Crag Hill to Sail. 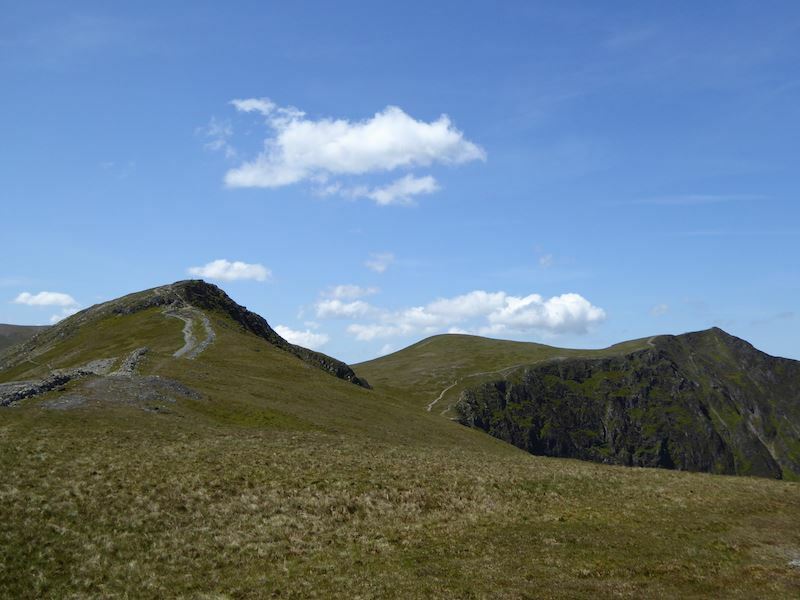 We were approached just here by a couple of holidaymakers who had come up from Braithwaite to here via the path up to Coledale Hause. They wanted to take a different route for the return leg and were asking us about this path and possible difficulties. We reassured them it was OK and suggested they follow us down so they had some company and assistance if necessary, but they just didn’t have the confidence to do so. 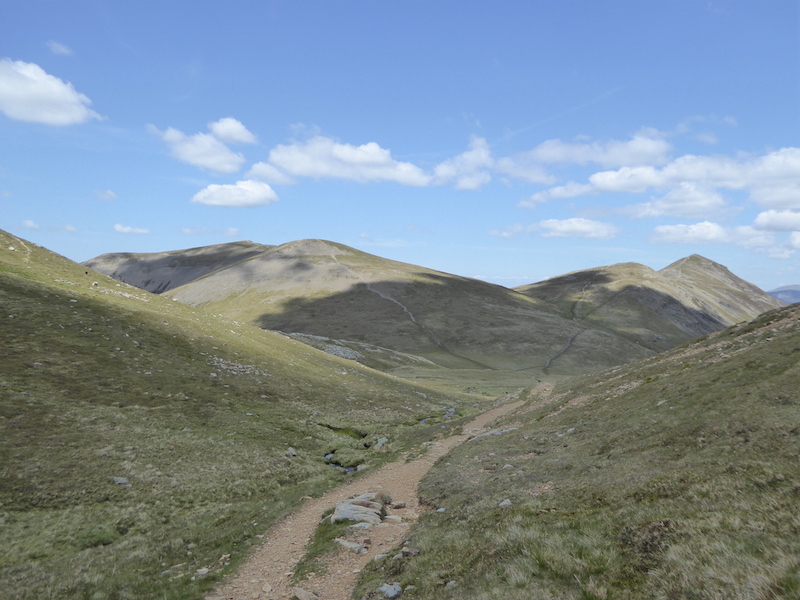 They watched us going down until we disappeared in the undulations of the ridge so I can only assume that they returned via the Coledale route. Safely over the rocky section and another chance to take in the view. 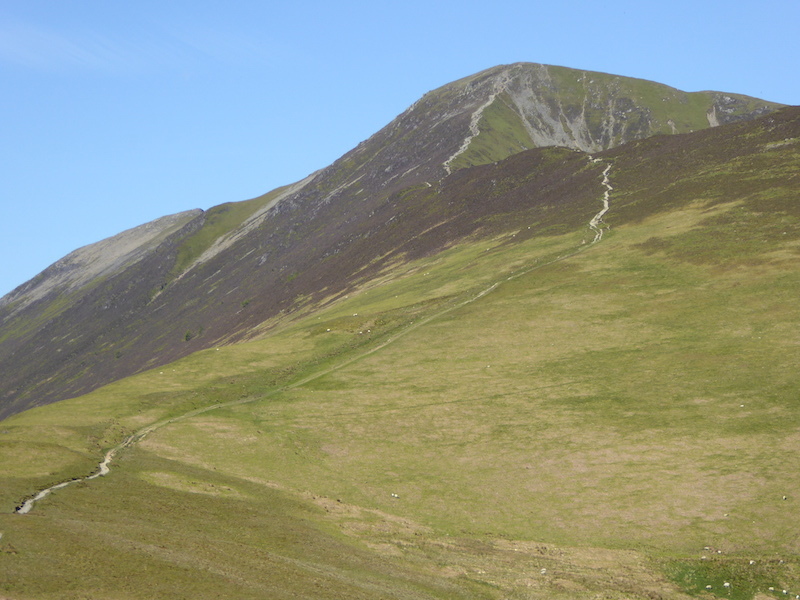 The long fell immediately below is the Ard Crags – Knott Rigg ridge with Robinson behind it. That’s the bit we’ve just come down, not as bad as it looks though. 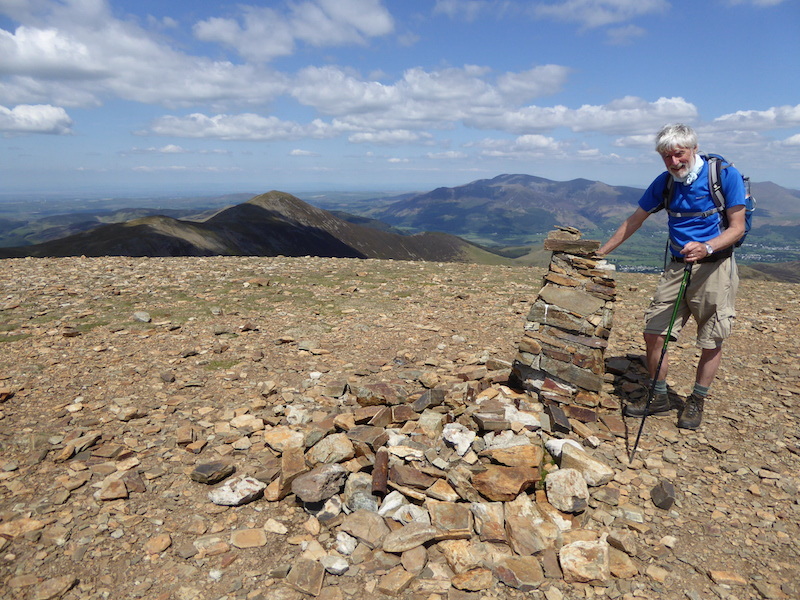 Quick, take my picture, I’ve just conquered the north face of the summit cairn on Sail. On Sail with Crag Hill behind. 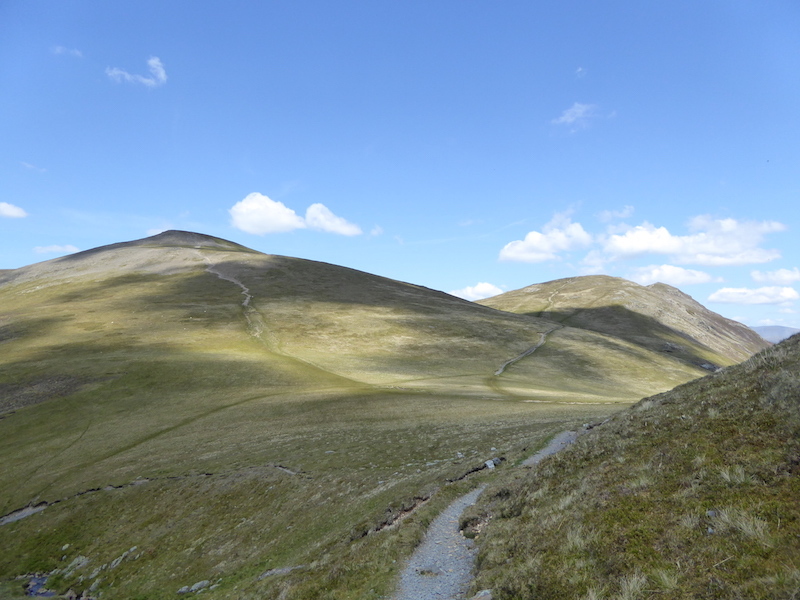 As you can see the path on Crag Hill is straightforward enough, the little rocky section in the middle is more of a nuisance than a difficulty. 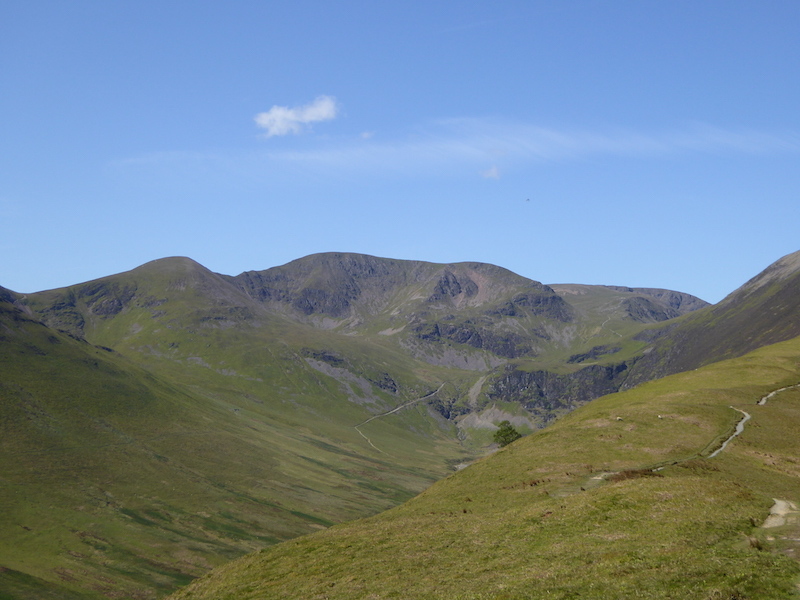 A view eastwards of the Dodds and the Helvellyn range from Sail. Off we go down Sail making our way towards Scar Crags and Causey Pike. 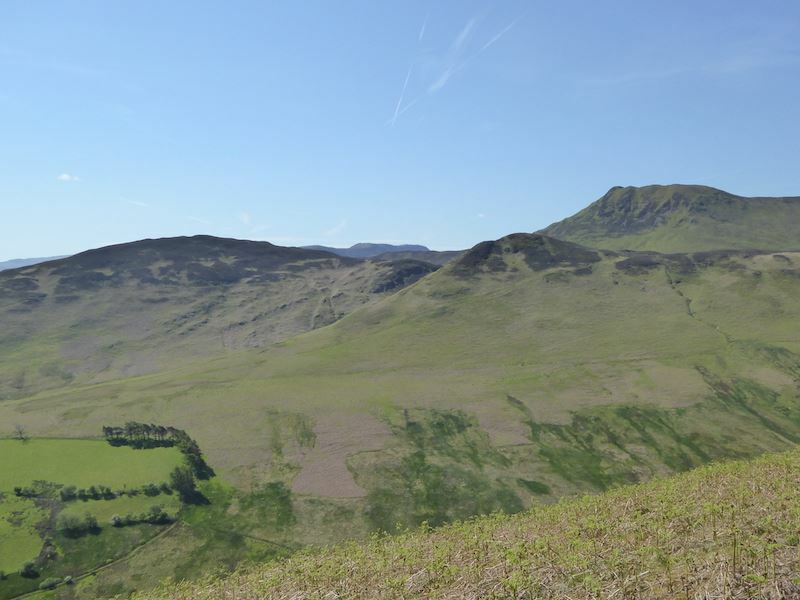 Just below us is the Ard Crags and Knott Rigg ridge, and the long dark ridge just below the skyline is the Maiden Moor to High Spy one. 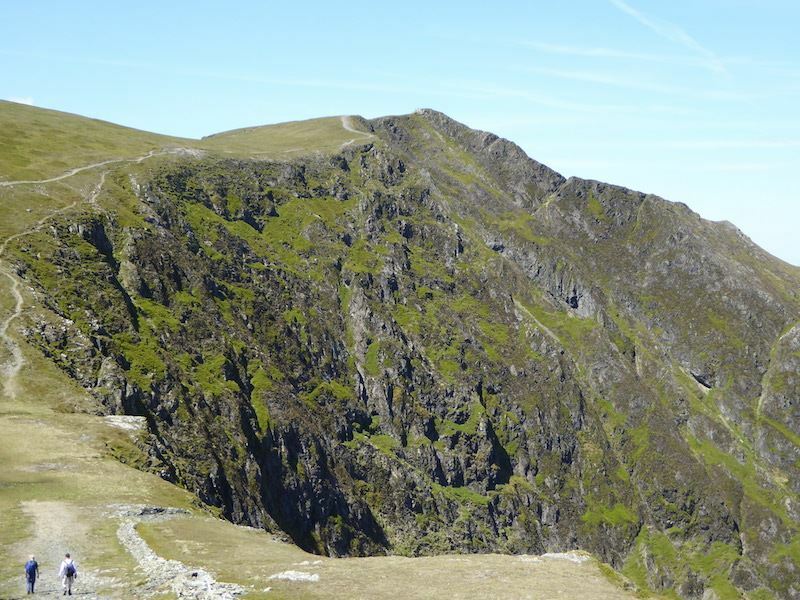 A close up of the Force Crag Mine down in Coledale. 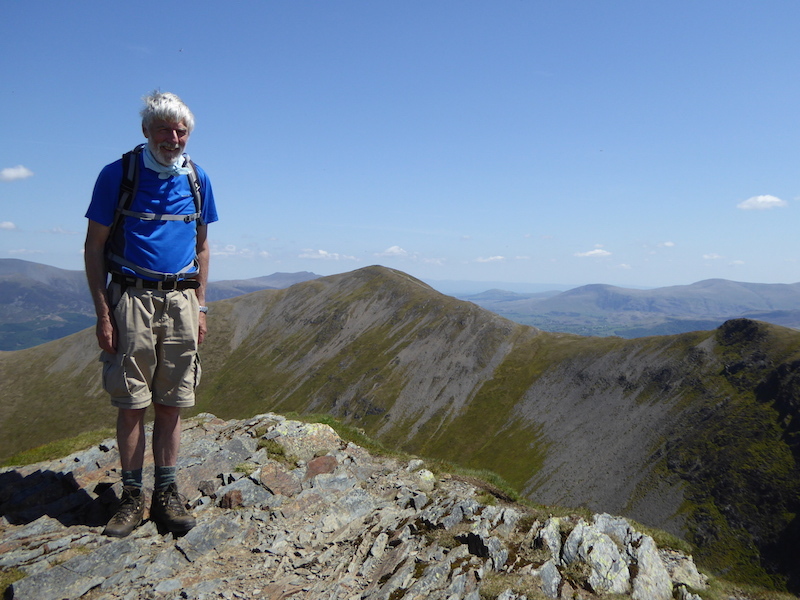 Here we are on Scar Crags summit looking towards Causey Pike. 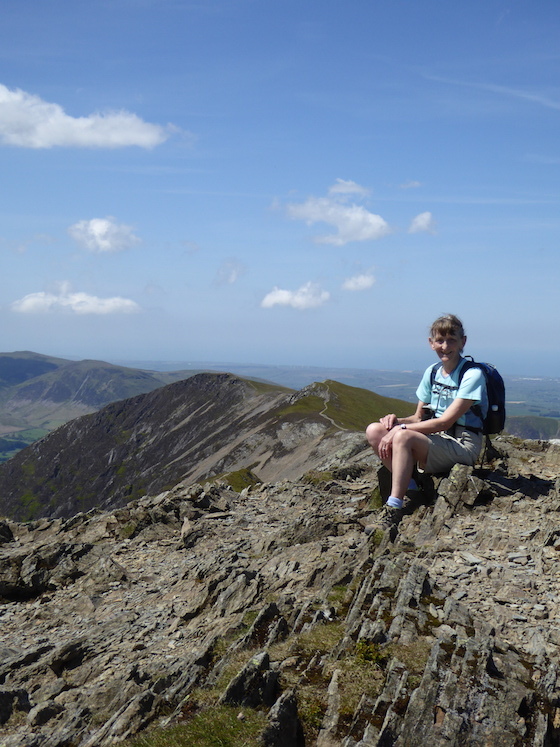 Taking a breather on Scar Crags summit. 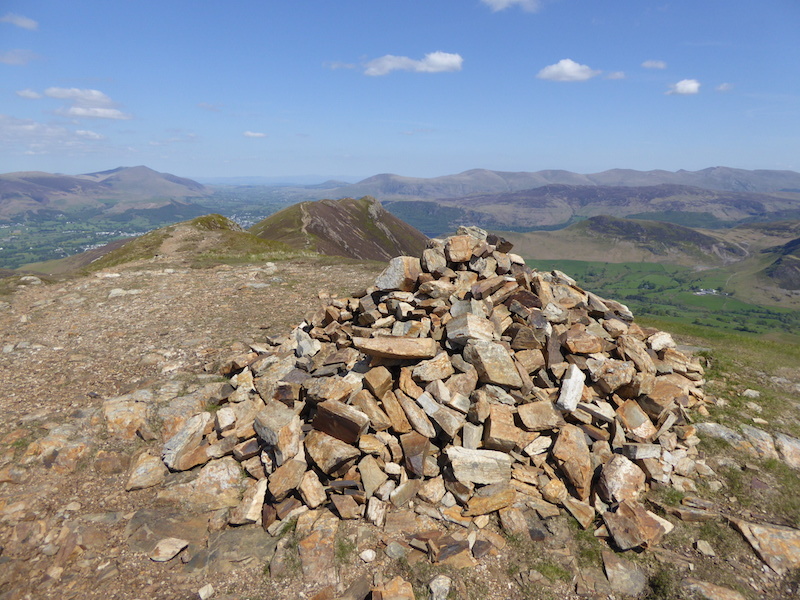 Scar Crags summit cairn, and I’m about to attempt a daring ascent of its north face. Ard Crags down below us. We used to play roly-poly down hills when I was a kid, but best not to try it down there though, eh? 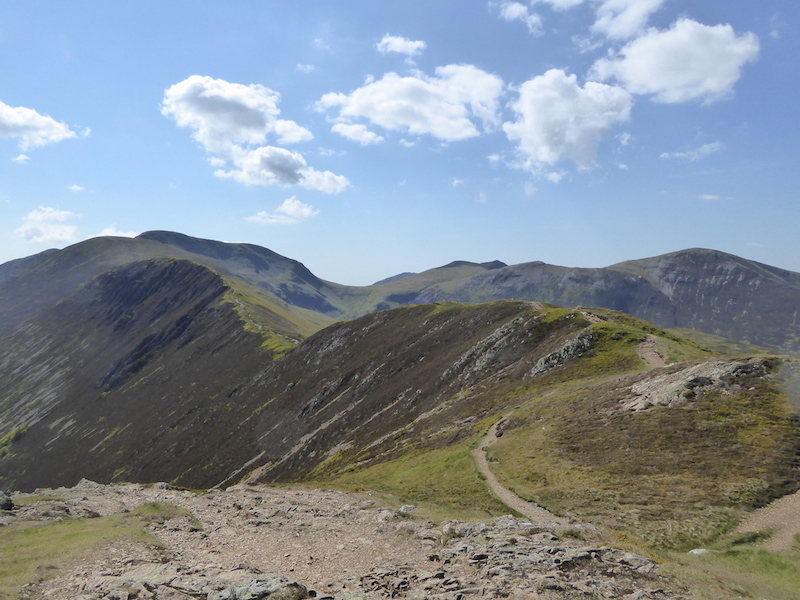 Causey Pike in front us, the last fell of the day. 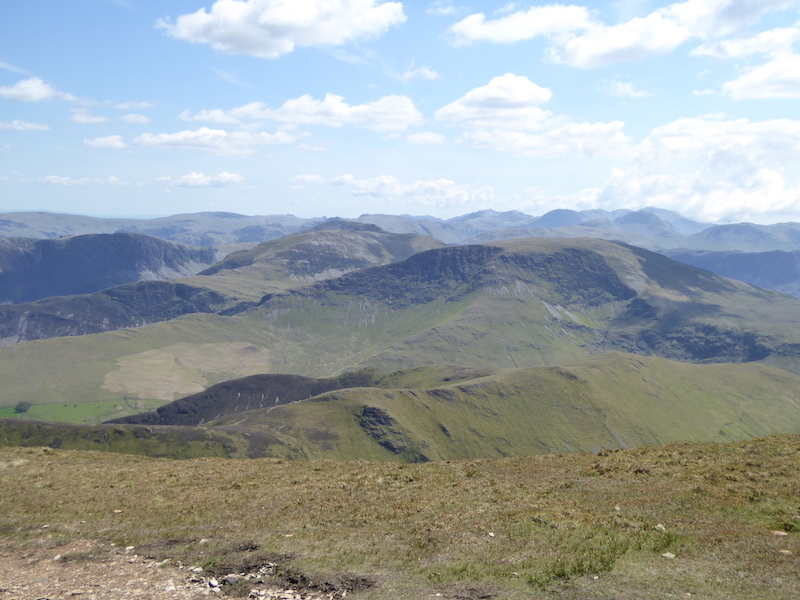 Robinson over on the left with the Ard Crags to Knott Rigg ridge in between. 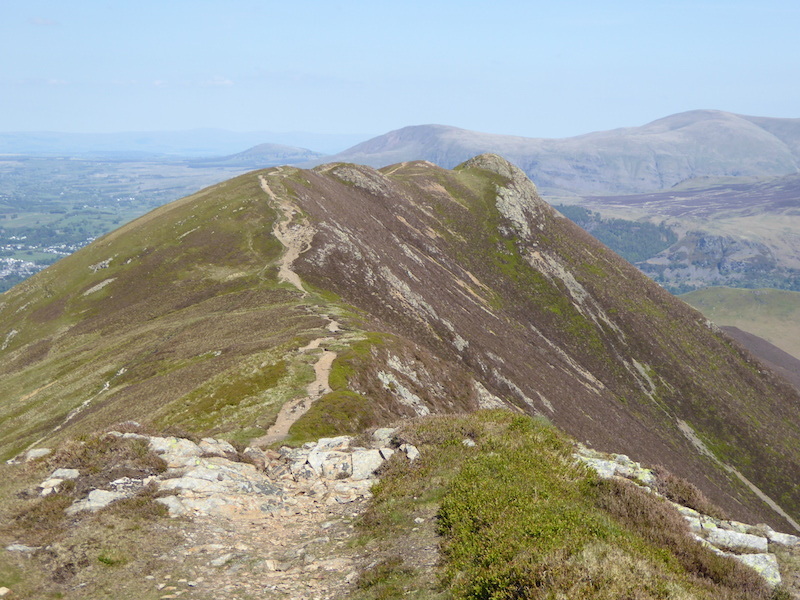 Approaching the summit of Causey Pike. 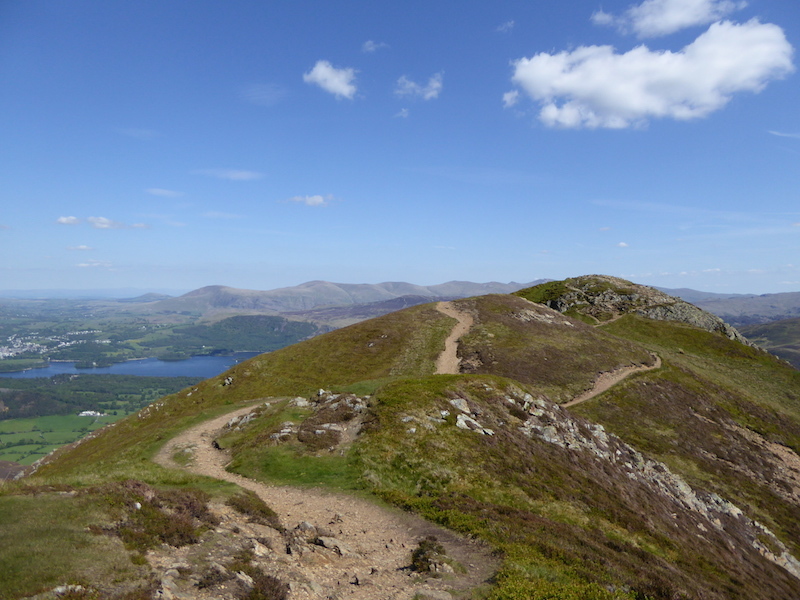 On Causey Pike summit looking across to Derwentwater and the eastern fells. 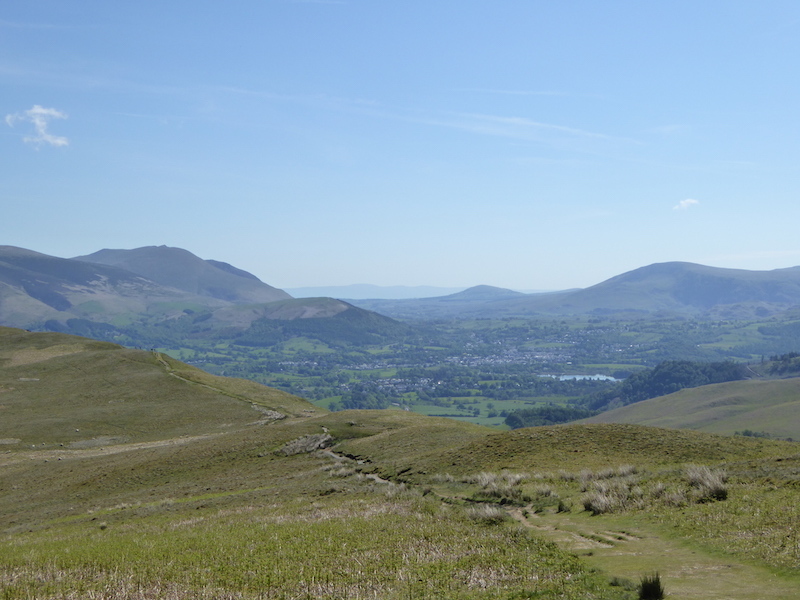 Skiddaw and Blencathra across the vale of Keswick, Bass Lake over to the left. 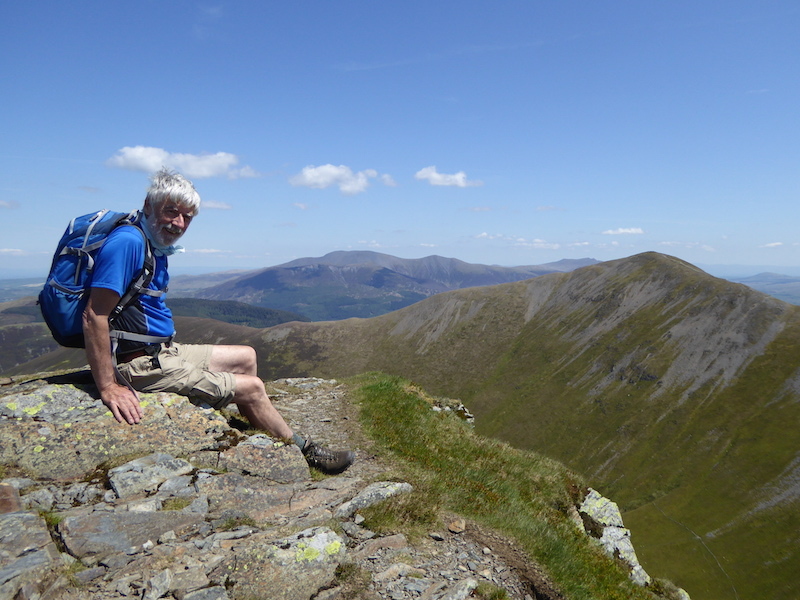 A short ‘pit stop’ on Causey Pike. Its good to know that there is no more ‘up’ today. 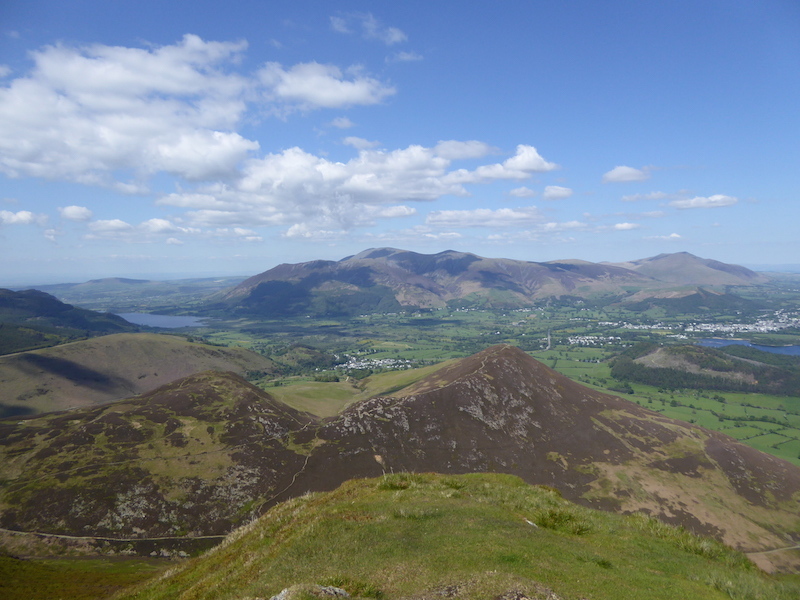 A look back from Causey Pike at the fells we’ve walked today and what a fabulous day to walk them too. 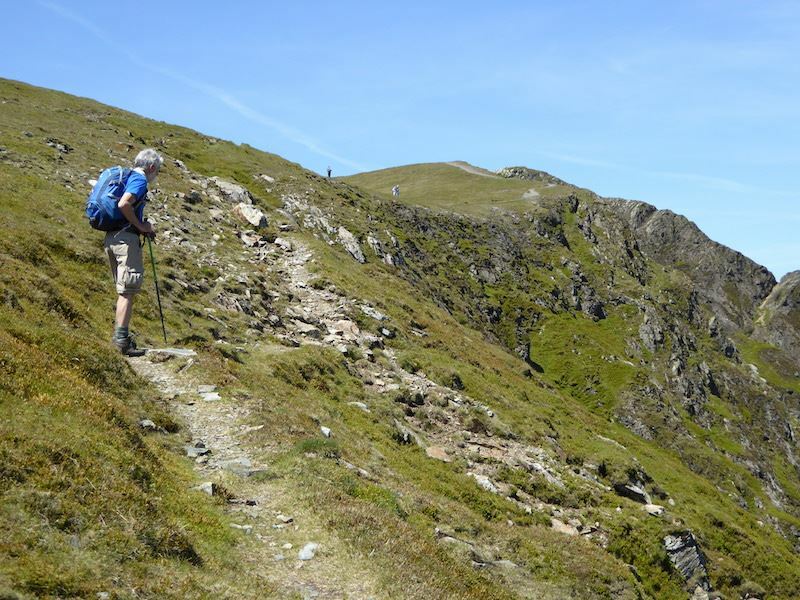 Making our way down towards Barrow Door, which is the gap between Stile End and Barrow. 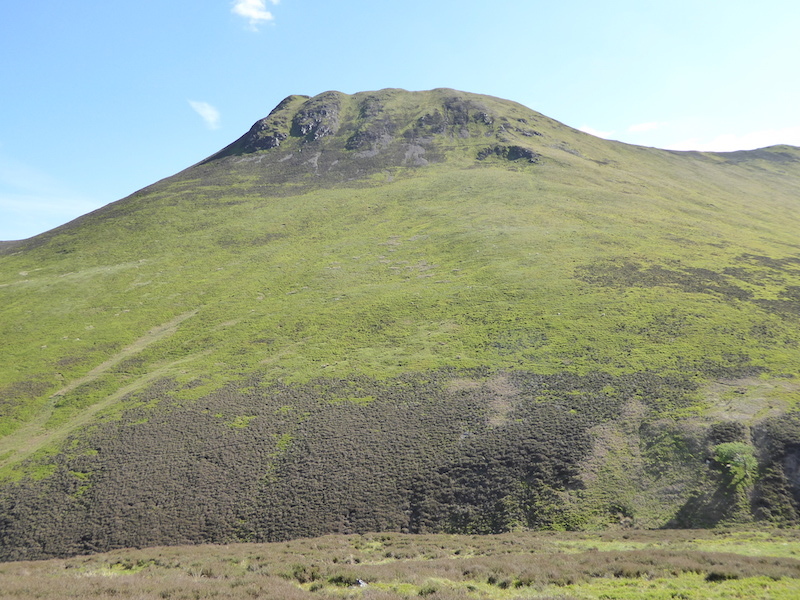 On the way we pass alongside Causey Pike which we have just descended. 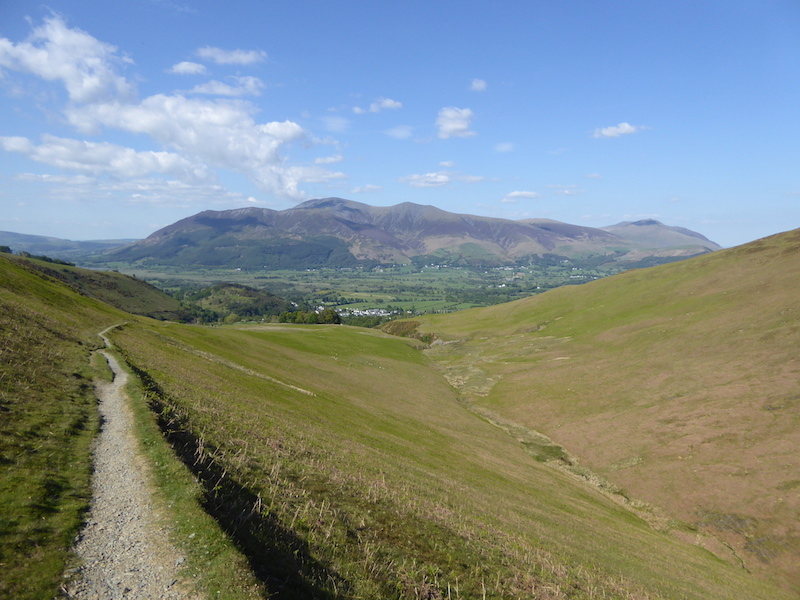 The path from Barrow Door takes us back into Braithwaite with this splendid view of Skiddaw and Blencathra all the way down. 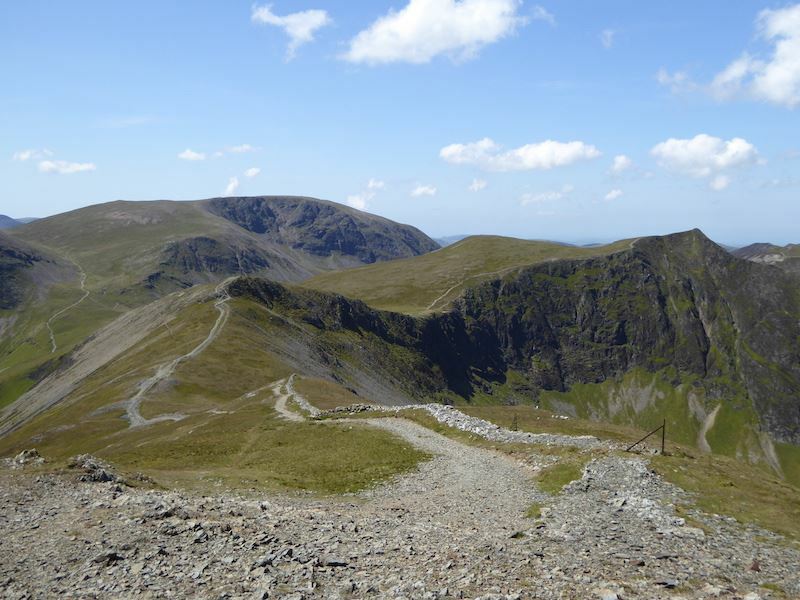 As we got back to the car we were approached by four people from the Phillipines asking where to find the path to the Force Crag Mine, which just happened to be a few paces from the car. They disappeared along the path through the trees only for two of them to re-appear a minute or so later. I had to ask why and found out that the male of the couple couldn’t stand all the midgy things that were flying around. I did say that they wouldn’t bother them for long once they were through the trees and out in the open but to no avail and back down the road they went. Perhaps they don’t have midgy things in the Phillipines.